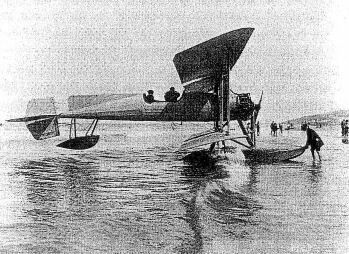 The Avro 504 prototype during the time it was flown by Henri Salmet on the Daily Mail tour of British coastal resorts in 1914. An alternative float undercarriage could be fitted. 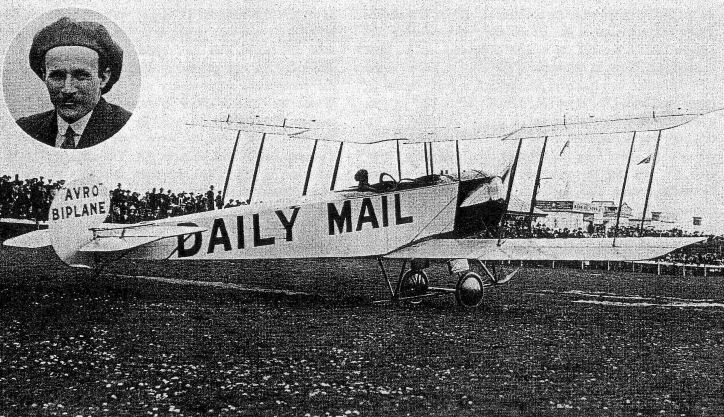 This was the aeroplane that made the company's fortunes. The creation of Geoffrey de Havilland, the two-seat Royal Aircraft Factory BE 2 made its debut in the late spring of 1912 and was essentially a slightly uprated engined development of the previous years one-off BE I. 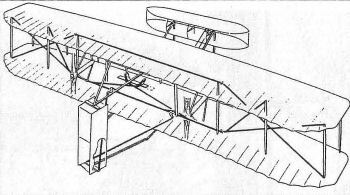 Unlike the BE I, however, the original BE 2 was not just to establish a new British altitude record for two-seaters in June 1912, when de Havilland and his passenger reached 10.560 feet, but was to prove to be a true survivor - some would argue it survived too long - in the process siring a family of BE 2 production variants that would account for a further 3,241 aircraft. 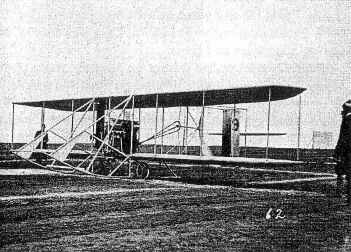 Seen here is BE 2a, serial no. 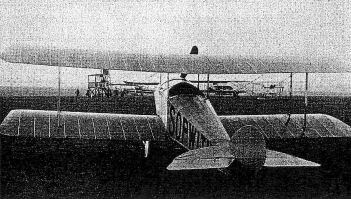 206, photographed wearing an experimental oleo landing gear, along with streamlined cuffs at the upper end of its interplane struts. As with all 14 BE 2as, this machine was powered by a 70hp Renault, which gave it a top level speed of 70mph at sea level, falling to 65mph at 6,500 feet. 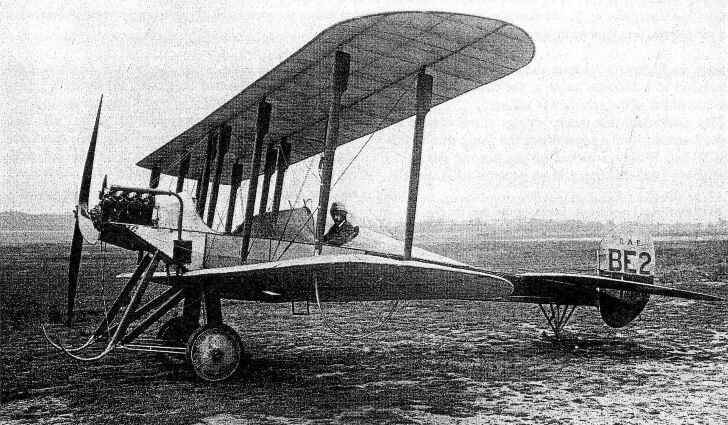 De Havilland designed the outstanding B.E.2 biplane for the Royal Aircraft Factory. The type is represented here by an aircraft of 2 Squadron, Royal Flying Corps, en route from Farnborough to Montrose, Scotland, in October 1913. Louis Bleriot crossed the English Channel in his Anzani-powered No XI monoplane on 25 July 1909, thus securing undying fame and worldwide orders for his aeroplane. 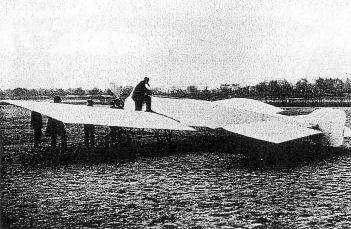 This picture of the cross-Channel aeroplane was taken after the event. 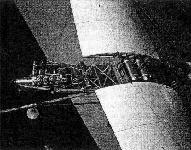 A close-up showing the wing-warp control cables of the Bleriot XI. 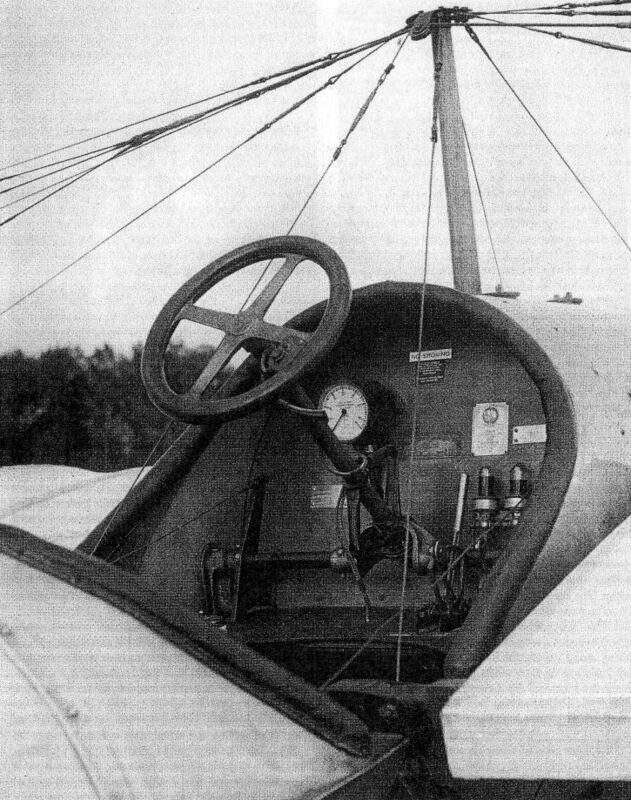 Wires from the base of the cloche are attached to a rocking arm at the apex of the inverted pylon beneath the cockpit, to which are attached the cables leading out to the wings. Balance cables attached to the wing upper surface travel through the rear kingpost of the cabane in front of the cockpit. 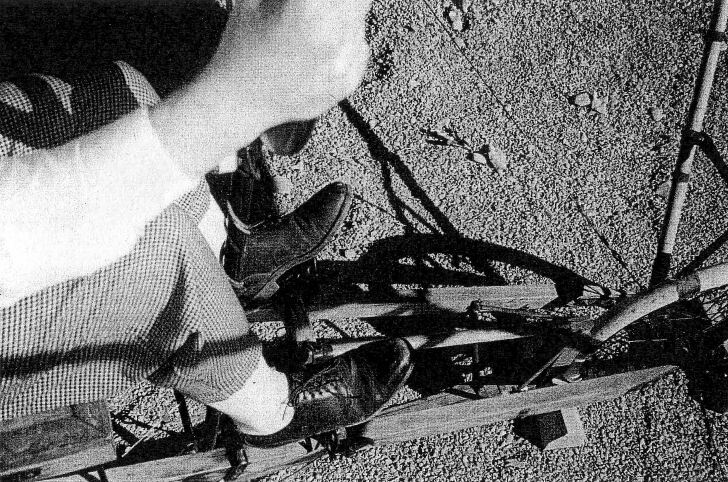 The use of tape to help keep the tyres on the wheel rims was common practice. 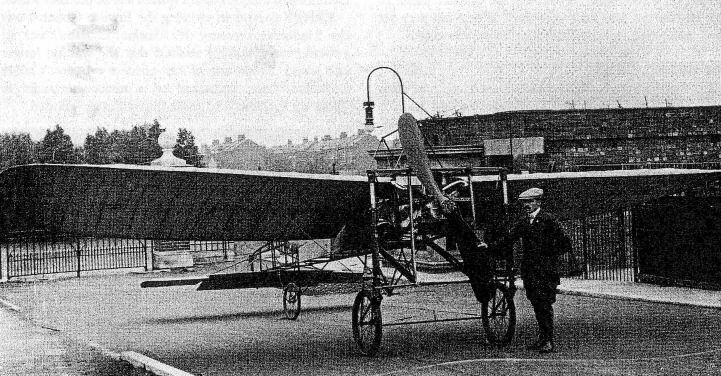 Gustav Hamel prepares to take off from Hendon in yis Bleriot XI monoplane on 9 September 1911 to make the inaugural United Kingdom Aerial Post flight to Windsor. The flight, made under adverse weather conditions, took ten minutes, Hamel averaging 105mph. 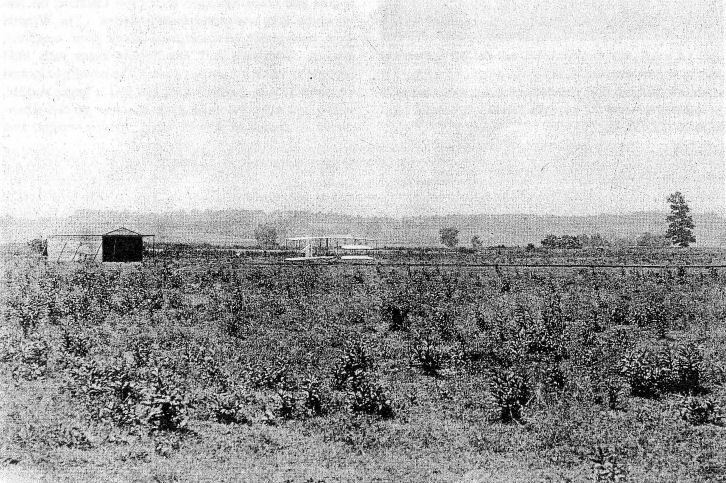 Rhinebeck's Bleriot flies low along the flight line; note the tail-high attitude. 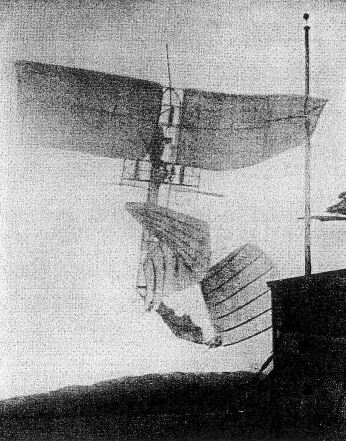 Early aeroplanes are susceptible to the slightest winds, and the merest hint of a crosswind component can jeopardise a landing, even with the Bleriot's swivelling undercarriage. Here, the Shuttleworth Collection's Bleriot XI on to its starboard wingtip during a landing run. Prompt action by the pilot righted it, and no serious damage was done. 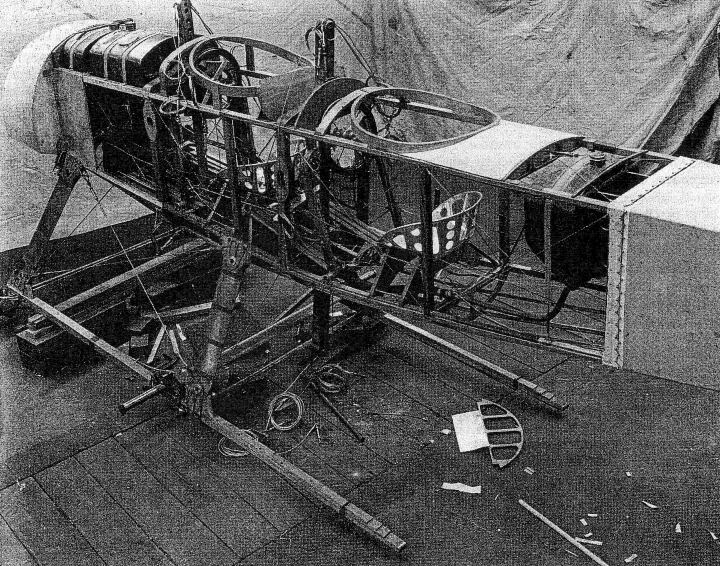 The 'business end' of the Rhinebeck Bleriot XI, showing its inverted-Y 25hp Anzani radial engine and the 'bedstead' frame to which the main undercarriage is attached. The Bleriot control cloche, with the rudder bar in front. The wheel on top of the column does not turn, but serves only as a grip. The throttle lever is mounted on the right side of the control column. 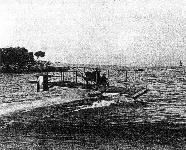 Francis McClean leaves Ramsgate in the Short S.80 Nile seaplane in November 1913. During the early months of 1914 this aeroplane was flown in stages up the River Nile from Alexandria, on an expedition to see the Aswan Dam and investigate the contracts from there to Khartoum. It subsequently served with the Royal Naval Air Services. 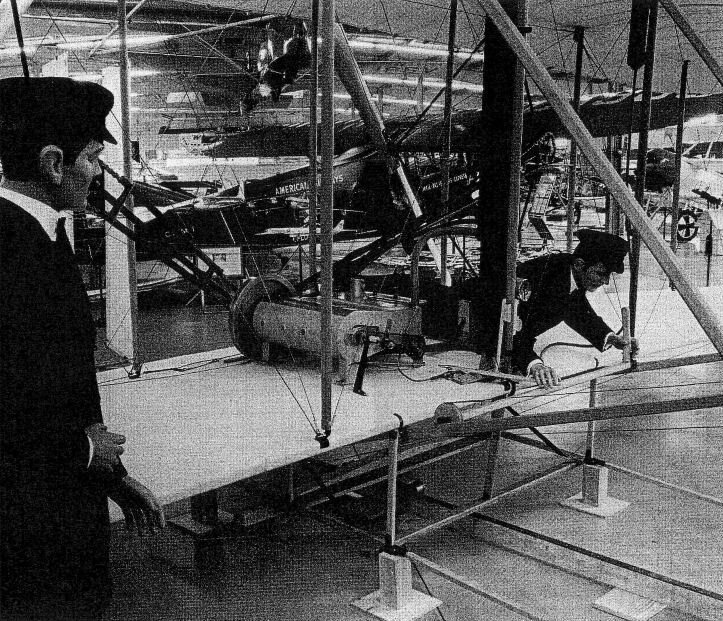 This view of the first Sopwith Tabloid at Hendon shows to advantage its relatively wide cockpit, seating two side-by-side. When it first appeared, in November 1913, it impressed everyone with its sprightly performance, and soon won orders from the military. One of the world's oldest airworthy original early aeroplanes, the Shuttleworth Collection's 1910 Deperdussin monoplane makes short straight flights on still evenings on the power of its three-cylinder 35hp Anzani Y-type radial engine. THis is the school or 'popular' version of the breed, lacking the refined lines of its racing brothers. A 1913 Deperdussin racer in flight. The cleanness of the design was enhanced by the large propeller spinner, which greatly reduced the drag caused by the rotary engine's frontal area. 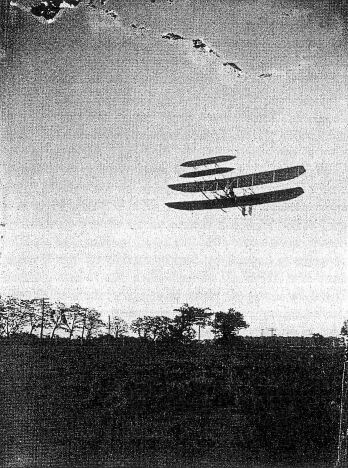 Claude Grahame-White sets off in his Farman biplane during the Harvard-Boston Aviation Meet at Atlantic, Massachusetts, from 3 to 13 September 1910. Grahame-White won by far the greatest amount of prize money at the event, coming away with $22,100. 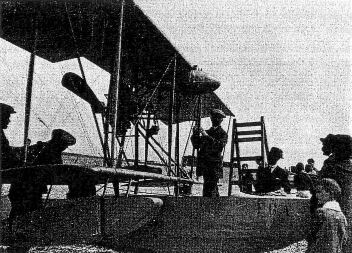 Lieutenant de Vaisseau Conneau, who flew under the pseudonym 'Beaumont', is seen here at Magnus Volk's Waterplane Station at Brighton with the Franco-British Aviation (FBA) Leveque flying boat which he had flown across the Channel to Newhaven, England, on 16 August 1913. He is holding the crank-handle of the aeroplane's 80hp Gnome rotary engine. 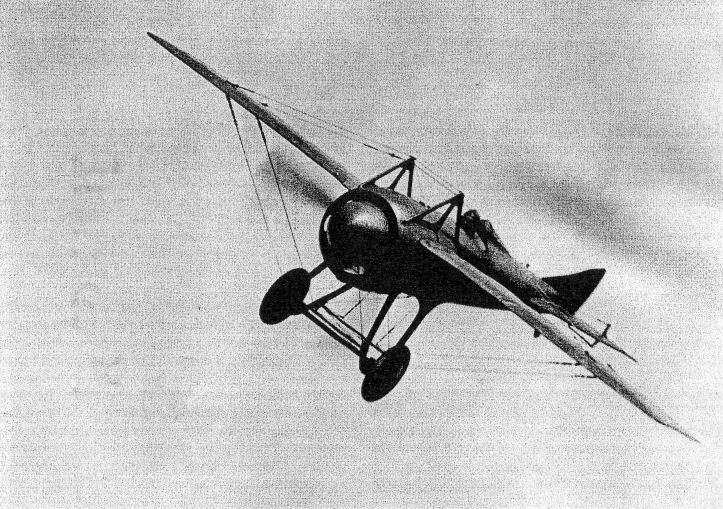 When monoplanes were modified to perform the first aerobatics, including inverted flight and loops, one of the most conspicious alterations was that to the bracing pylons or cabanes, which were made taller to increase the angle of the bracing cables to the upper wing surfaces, thereby reduving the tension in the cables to enable them to meet higher loads. 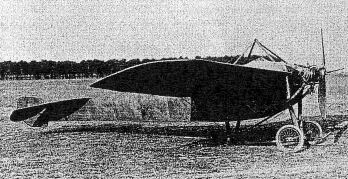 This is Gustav Hamel's 80hp looping Morane-Saulnier at Cambridge in 1914. 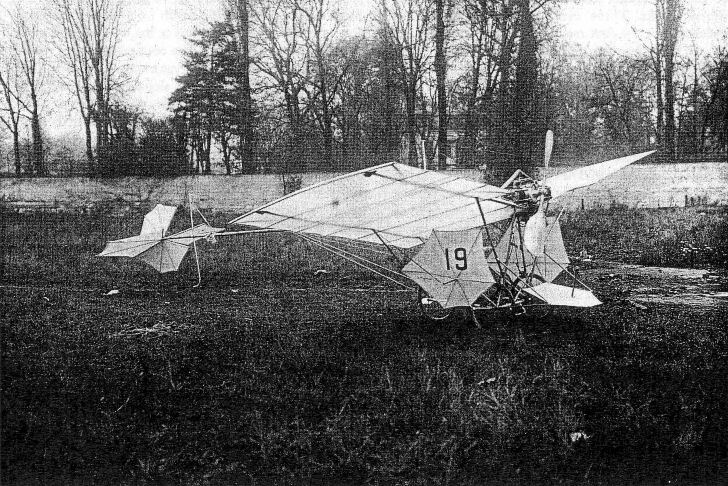 Although the Morane monoplanes were trickier to fly than the Bleriots, they do not appear to have suffered so much from wing troubles. 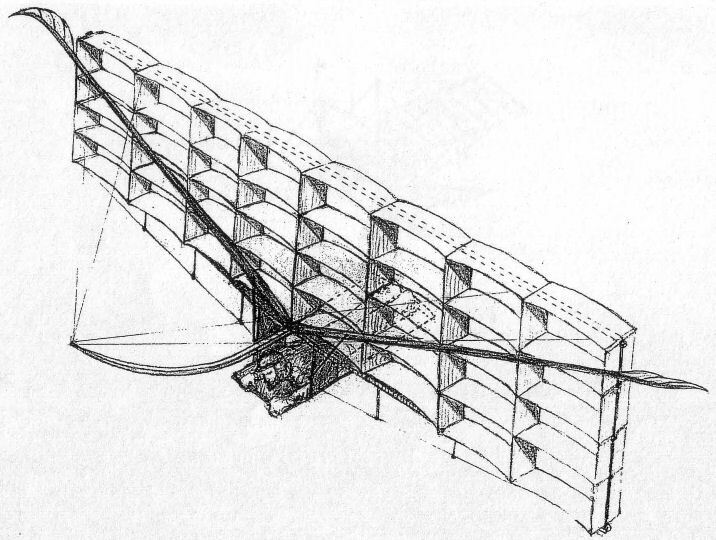 In this study of Brindejonc de Moulinais about to depart in 1913, the normal, very short bracing pylon in front of the cockpit is apparentm as well as the continued use of human restraint in lieu of chocks. 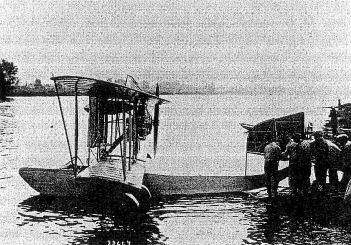 A Curtiss Model E at the 1912 Monaco Hydroplane meeting taxies out for take-off. 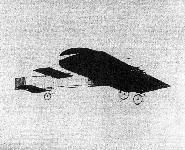 The Curtiss Model H America of 1914, built to attempt the non-stop Atlantic aeroplane. 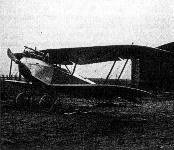 Its two 90hp Curtiss OX engines proved unable to lift the fuel required for the crossing and a third was added, but war caused the attempt to be abandoned. 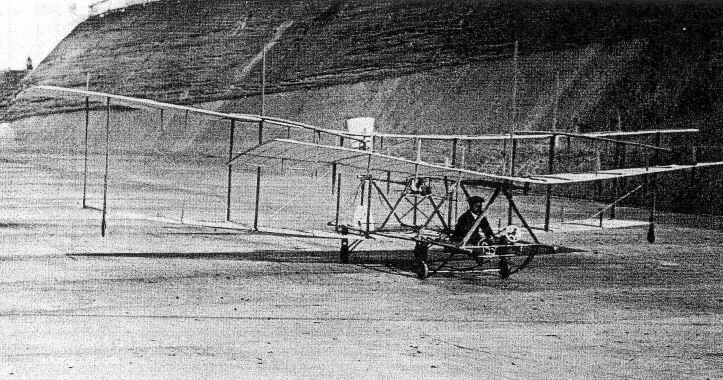 Daredevil Wright exhibition pilot Arch Hoxsey prepares to take off from Dominguez Field, Los Angeles, on 31 December 1910 in his Wright Model B, for what was destined to be his last flight. 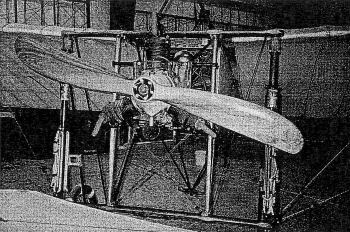 This Wright Model B, now in the Musee de l'Air, Paris, has a two-lever control system. After he failed to come out of a spiral dive, Hoxsey lost his life in the resulting crash. He was not the only Wright pilot to defy the entreaties of Orville and Wilbur by performing dangerous stunts. 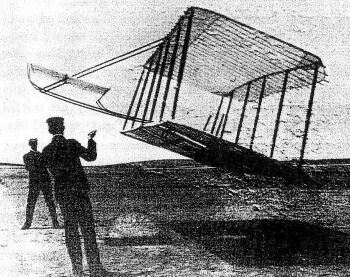 There have been various interpretations of the massive aeroplane built by Russian naval captain Alexander Mozhaiskii, of which this is one. It is now doubted whether this machine left the ground at all when it was tested in 1884, as it was seriously underpowered. 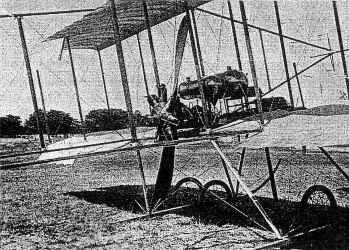 The other engine that did so much to advance the aeroplane's development was the 50hp Gnome rotary, seen here installed on Bristol Boxkite No 10 in May 1911, during demonstration flights in Australia. 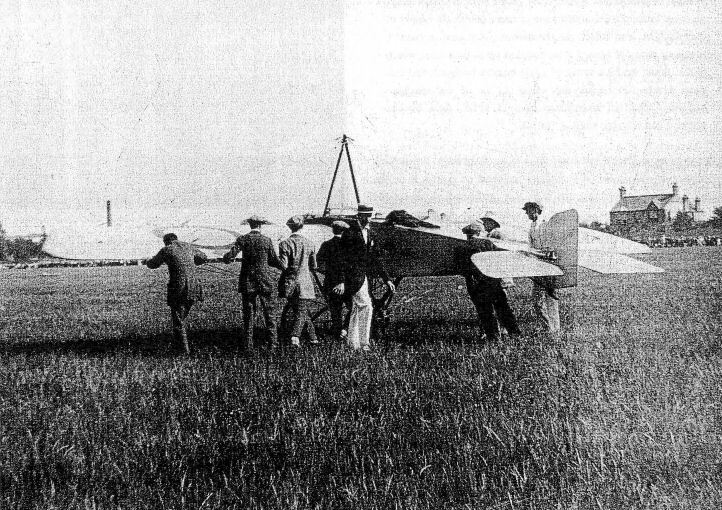 Captain Bertram Dickson prepares to fly his Bristol Boxkite during the British Army maneouvres on Salisbury Plain in September 1910. 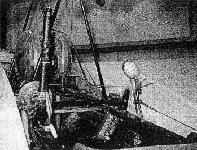 The wrekage of the Bristol Boxkite in which Captain Reynolds had his remarcable escape on 19 August 1911. He stood on the underside of the upper wing as the inverted aeroplane made its haphazard descent from 1,700ft, then jumped clear just before impact. 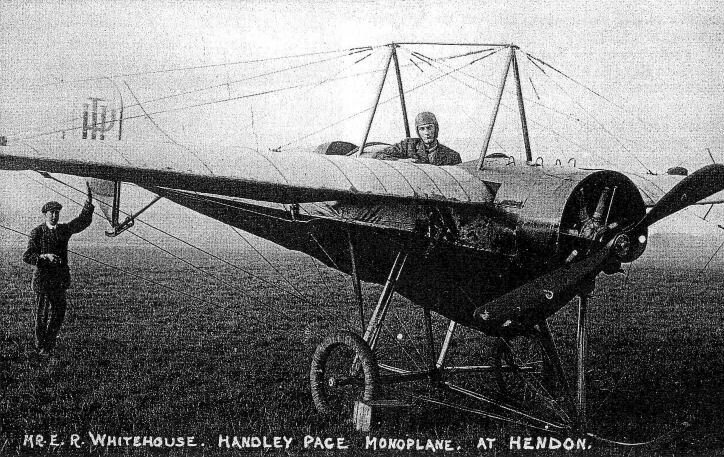 Handley Page's Type E monoplane of 1912, dubbed the 'Yellow Peril' because of its yellow-varnished crescent wings, was the ypung company's first truly successful aeroplane. The restored Avion III on display at the Musee des Arts et Metiers in Paris. Its powerplant has been removed and is displayed nearby. The twin counter-rotating propellers are mounted with the starboard unit slightly behind the port to enable their discs to overlap. 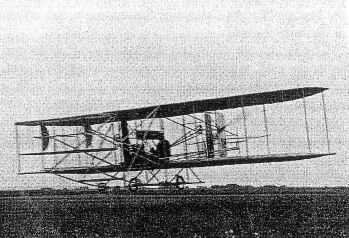 First flown in September 1907, the Voisin-Farman I began life with a wide-span tail unit, but had been substantially modified by its owner-pilot by the end of 1908, by which time it had made significant flights. The nacelle of the Musee de l'Air's Voisin biplane reproduction, showing the pusher engine and the pilot's simple push-pull control to the forward elevator. The Voisin factory at Issy-les-Moulineaux in 1908. In the foreground is the curious and unsuccessful 'Flying Fish' short-span tandem triplane bought by Lieutenant Fritsche. 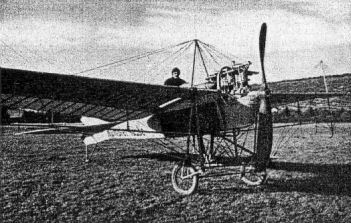 The big and cumbersome early Voisin biplanes, with their side curtains between the wings and no lateral control, were vulnerable to wind. 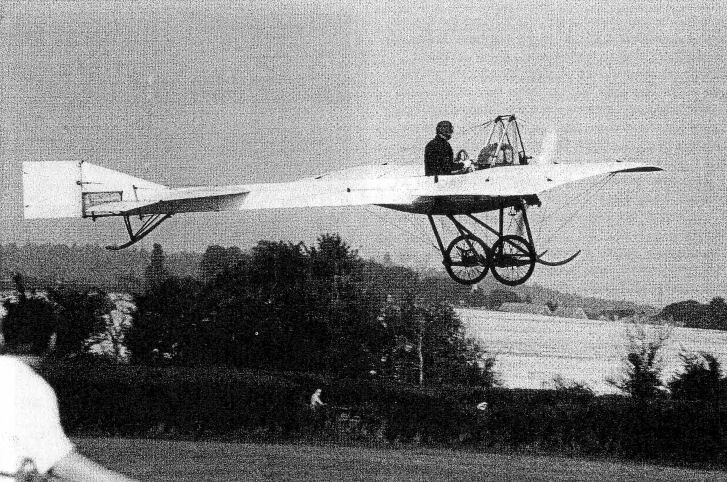 This one came to grief at Brooklands, Surrey, in January 1910 as a result of 'trying to turn in a side wind without laeving the ground'. 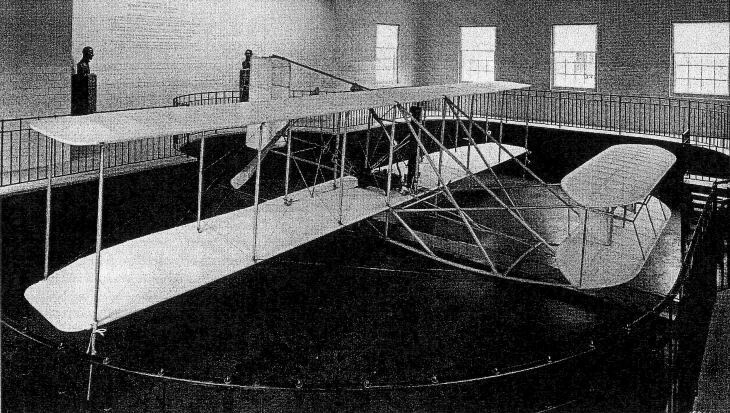 The Flyer III on display in the Wright Hall at Carillon Park, Dayton, Ohio. 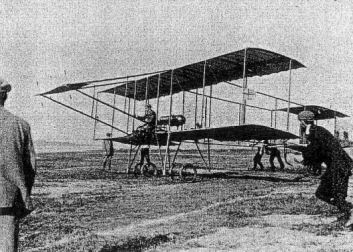 This aeroplane, which is probably more significant than the 1903 Flyer in the line of development, was the last Wrights' experimental machines. 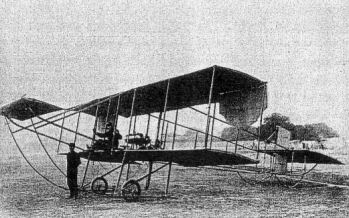 Although it was modified in 1908 to have two seats enabling the operator and a passenger to sit upright on the lower wing, it is now displayed in its original, prone-piloted form. 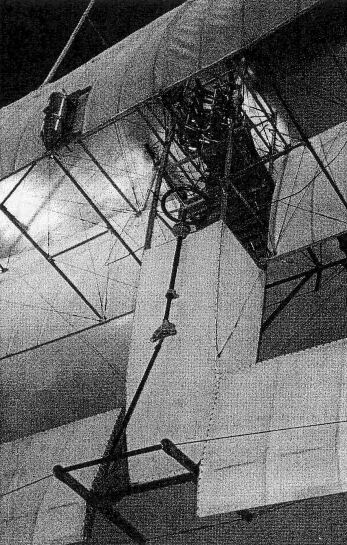 Willing helpers haul the weight to the top of the derrick in readiness to launch the Flyer A into flight in France in 1908. 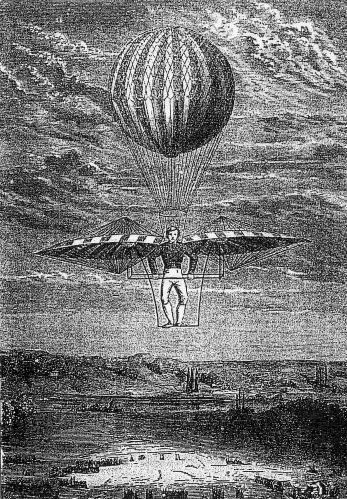 Wilbur's demonstrations of fully-controlled powered flight simply astounded the French Pioneers. 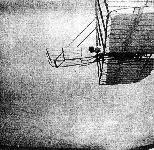 Flight 46, made on October 1905, was the last flight of the season to be photographed. 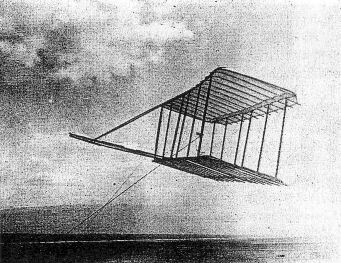 With Orville piloting, the Flyer III, the world's first practical povered aeroplane, remained aloft at a height of 40-60ft (12-18m) for 33min 17sec and covered 20 3/4 miles (33,456m). 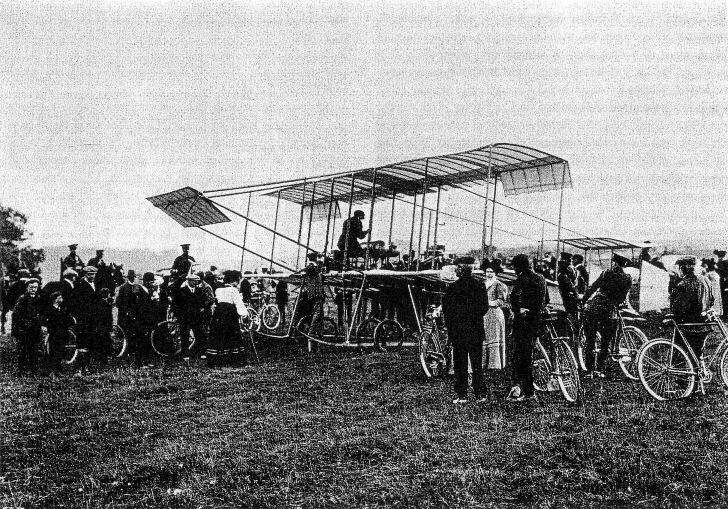 Wilbur Wright shows Europe true powered flight at Le Mans in August 1908. Nothing remotely approaching the Wrights' extended and fully-controlled flights had been seen by Europeans, who were completely astounded. 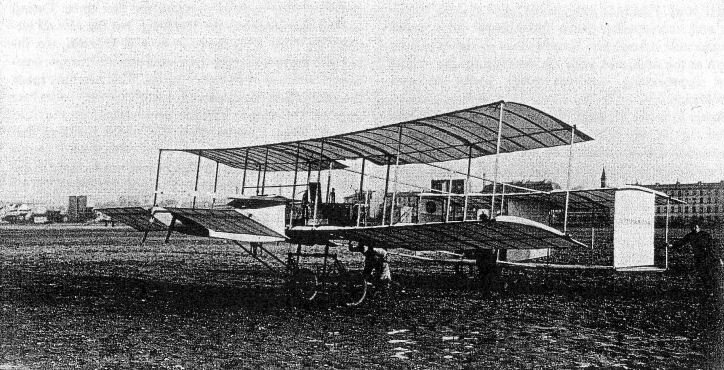 A French-built Astra-Wright Type A biplane of 1910. Despite innovations such as a wheeled undercarriage and a rear elevator, the design quickly became dated. 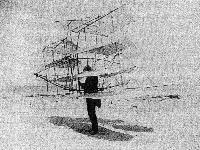 Taken only minutes before Charles Rolls' fatal accident at Bournemouth on 12 July 1910, this photograph of his French-built Wright biplane shows the outrigger framework carrying the moveable tailplane aft of the twing rudders. The surface's unsupported extremities can be seen to be bending downwards. 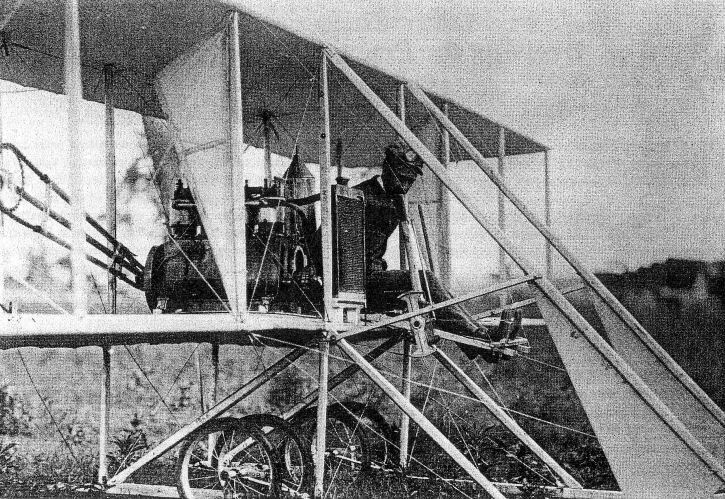 French-Wright pilot Eugene Lefebvre at the controls of a Wright Model A during the 1909 Reims meeting. 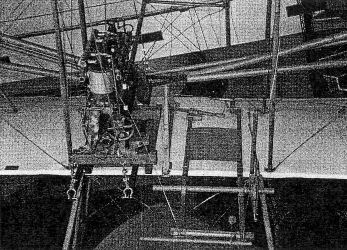 The lever on his right was moved from side-to-side to operate the warping control and fore and aft to work the rudders, while the one on his left operated the elevator. 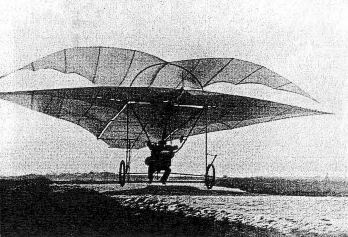 The classic form of the Antoinette monoplanes is represented here by the Antoinette IV, which had conspicious wingtip ailerons, replaced by wing-warping in later models. 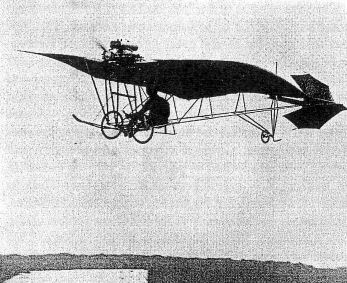 Santos-Dumont's diminutive No 19, which made three take-offs and short flights in 1907, was the true forebear of all ultra-light aeroplanes. 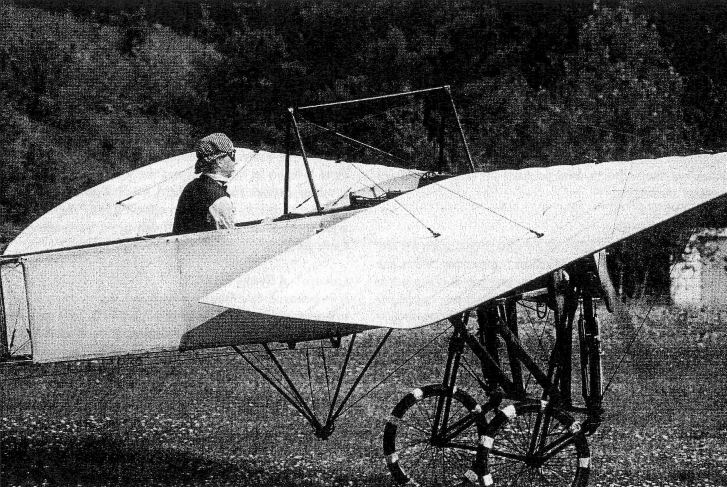 The French pilot Audemars in his Clement-Bayard-powered Demoiselle in 1910. These machines had tubular metal tail girders and 30hp engines. 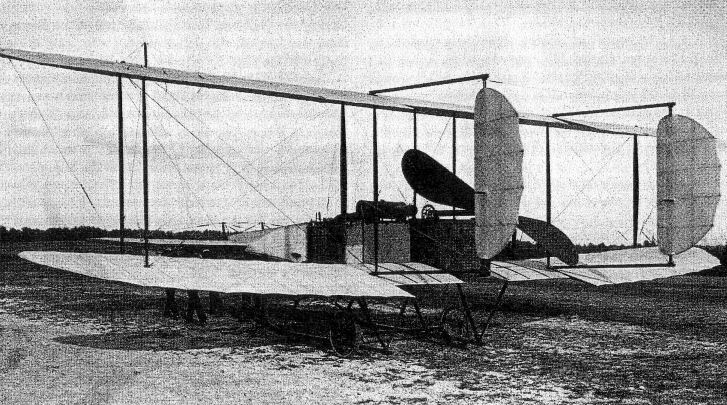 The Henry Farman III in an interim stage, with its original 50hp Vivinus engine but with four smaller ailerons. Subsequently it was given an open biplane tail and a 50hp Gnome rotary engine. 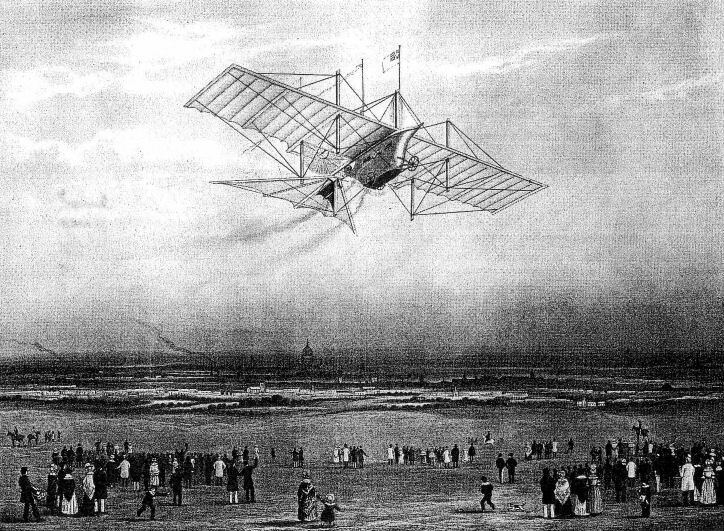 Numerous impressions were published of the Aerial Steam Carriage known as the Aeriel, the ambitious "airliner" that was the subject of a patent taken out by William Samuel Henson in 1842. Although it was never built, it boasted many features that would be seen on the pioneer aeroplanes of the early 1900s. 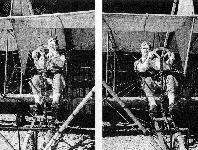 The Aerial Steam Carriage's engine was to drive a pair of 20ft (6m)-diameter six-bladed propellers through a belt drive. 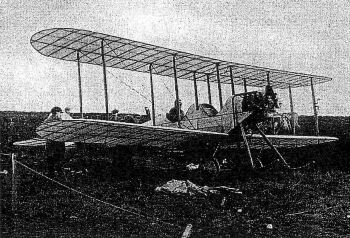 One of the best British products in mid-1909 was the Roe Triplane, which still lacked adequate control and had made only short straight flights. The second Roe I triplane (identified by cylindrical fuel tank, tail skid and tapered fuselage, in flight at Wembley, December 1909. 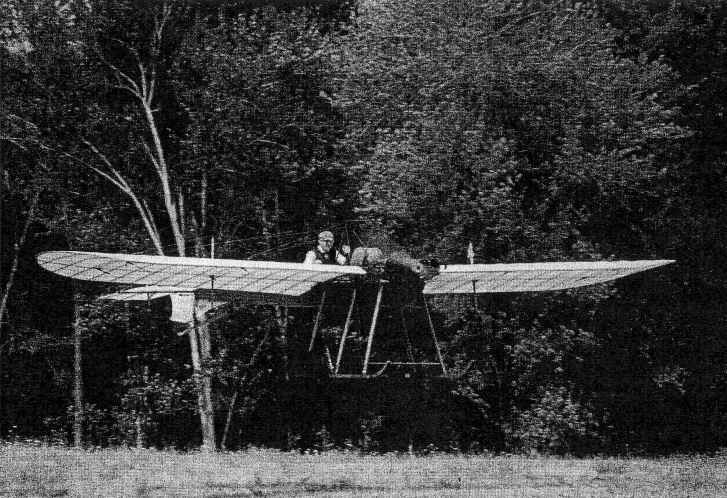 Pilcher prepares to fly his most successful glider, the Hawk, under tow from a hill at Eynsford, Kent, in 1897. 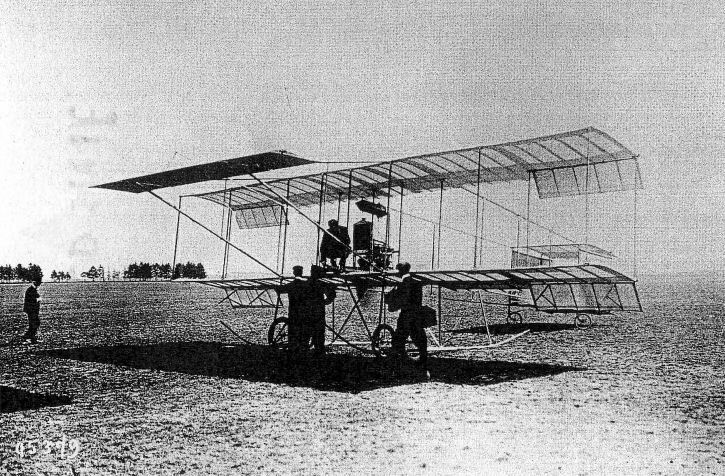 He died after this machine suffered an in-flight structural failure on 30 September 1899. About to start up the Model D pusher. The mechanic has the inenviable task of swinging the propeller amid the tailbooms and their bracing, and then getting clear of the aircraft as quickly (and carefully) as possible. 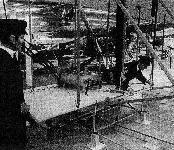 Clearly visible here are the youke round the pilot's shoulders and the simple bamboo pushrod control from the wheel to the front elevator. A dramatic low fly-past, with the engine emitting generous clouds of smoke. The interplane ailerons, attached to the outermost rear struts, are well shown. 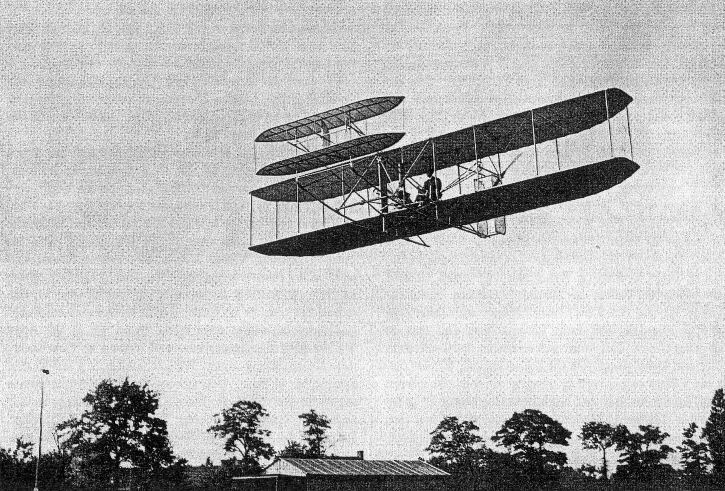 Curtiss and Wright both sold aeroplanes to the US military, but they were soon declared obsolete and dangerous. 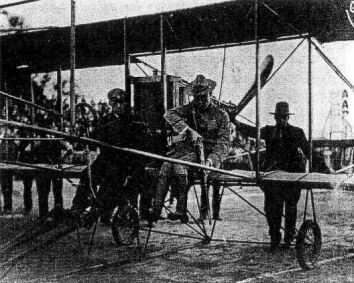 Here, at the Harvard-Boston Meet in 1910, rifle-armed Lieutenant Fichel of the US Army adopts the ground-strafing position on a Curtiss pusher, alongside pilot C F Willard. The Dan Taylor's demonstrates the shoulder-yoke aileron control of the Curtiss Model D pusher biplane. 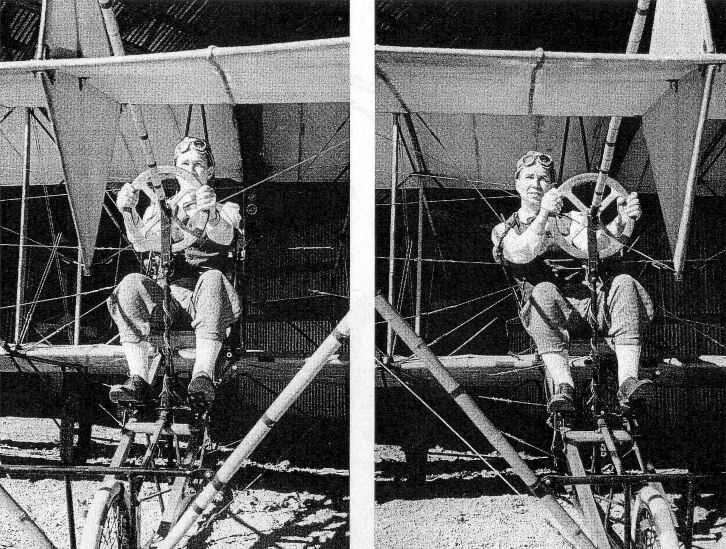 On the left he is sitting upright and the ailerons are neutral. On the right he leans to the right, and the yoke around his upper torso leans with him, moving the interwing ailerons to induce a bank to the right. The leather strap passing round his shoulders and behind his neck assits in manipulation of the yoke control. The dual foot controls of the Curtiss Model D. The pilot's left foot is on the 'claw' brake, the pedal for the friction brake on the front wheel is in the centre, and his right foot is on the throttle pedal. 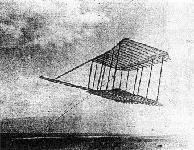 The Wright's 1900 glider being flown as a kite at Kitty Hawk. 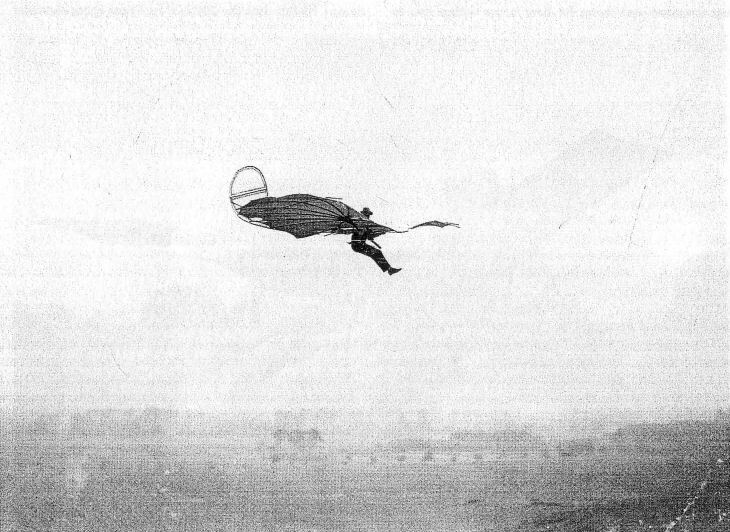 Wilbur (left) and Orville fly the 1901 glider as a kite. This machine failed to come up to expectations. 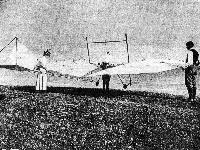 Wilbur Wright aloft in the 1901 glider. 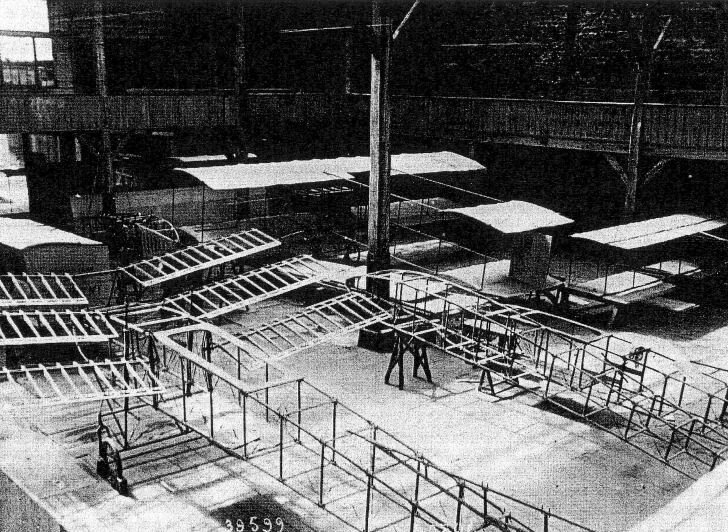 The problem they encountered with this glider led the Wrights to undertake their unprecedented programme of windtunnel tests. 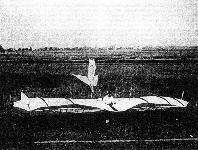 A successful practice glide in the 1902 glider in October 1903, after it had been fitted with twin moveable rear rudders. The Wrights' basic living accomodation and hangar are visible below. 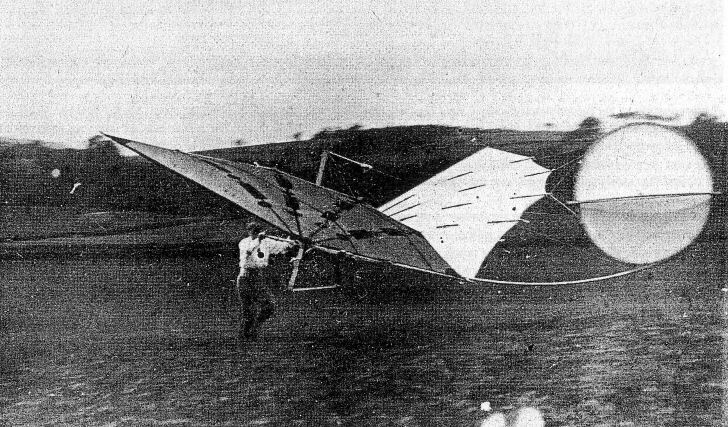 Dan Taylor airborne in 1910 Hanriot, with his left hand on the wing-warping lever. 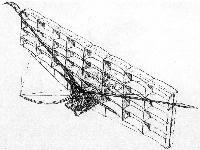 The Hanriot's all-fabric rudder is laced to a frame much in the style of sailing-boat practice. 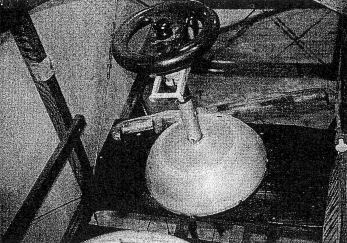 The Hanriot controls. Note the bulb on the right-hand lever for fuel pressure, and the coupe (blip) switch on top of the left-hand lever. Otto Lilienthal airborne in his Maihohe hang glider at Rhinow in 1893. Built mainly of willow and cotton shirting, it had wings that could be folded on the ground to aid transportation. 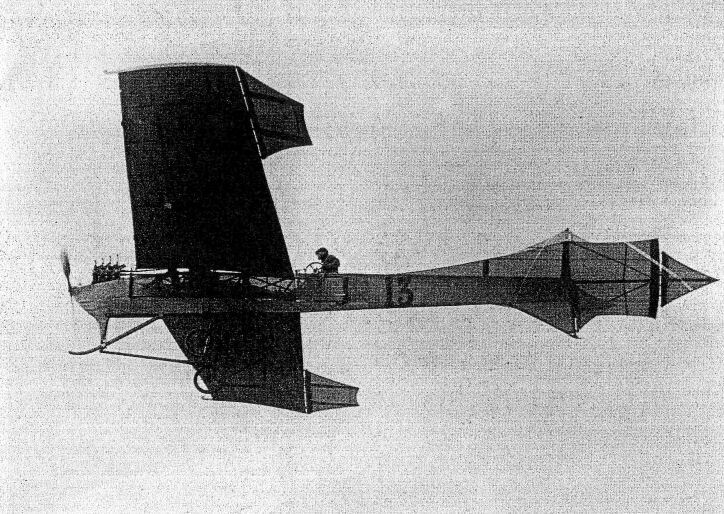 Lilienthal in his Vorlugelapparat of 1895, showing the patented leading-edge flaps intended to raise the glider's nose to aid recovery from a nose-dive, and the wingtip steering air brakes that were soon abandoned. 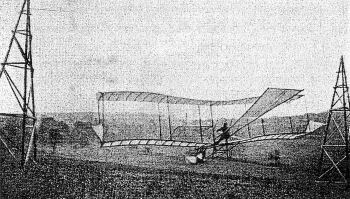 The large biplane built and flown by Lilienthal in 1895 spanned 6.2m (20ft 4in) and had a wing area of 24m2 (258.3ft2). He also built a smaller, 5.2m (17ft)-span version. Walter Windham also took two Humber-built Sommer biplanes with 50hp Gnome engines to Allahabad, and one is seen here in India with pilot Henri Pequet aboard. 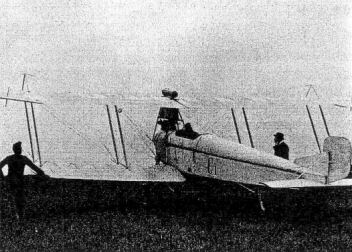 The neat little Nieuport 2N of 1910/11, powered by a Nieuport-designed 28-32hp air-cooled flat-twin engine, was fast enough to take the world speed record on 11 May 1911, but it had a contrary control system in which the warping was operated by what was usually the rudder bar, while lateral movement of the column worked the rudder. 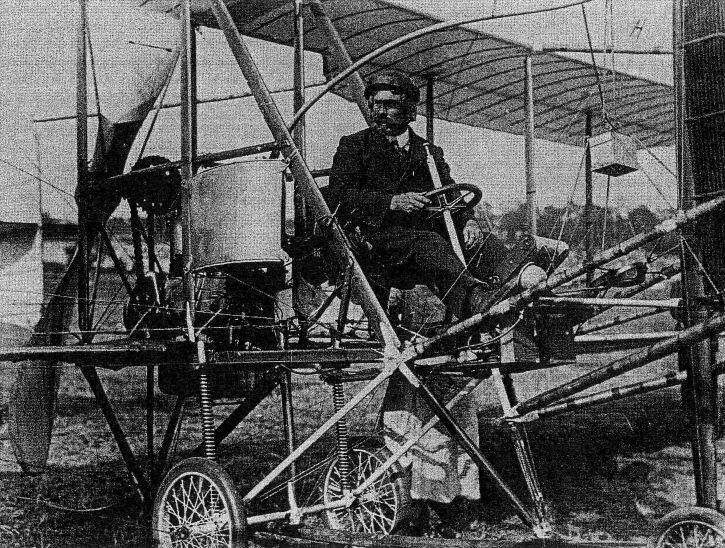 Because of such peculiarities, pioneer pilots often flew only one particular manufacturer's aeroplanes. 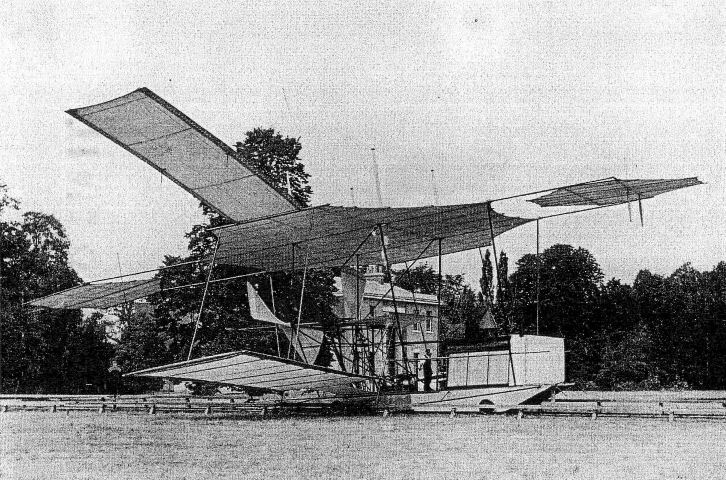 Despite its ungainly appearance, Henri Fabre's Hydravion, a canard pusher monoplane supported on three floats, made the world's first powered flight from water, on 28 March 1910. 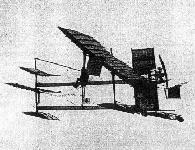 A pioneering commercial enterprise in which the Aeronautical Syndicate Limited's Valkyrie B canard monoplane played starring role was the carriage of the first aerial cargo, a consigment of Osram lamps. These were flown from Shoreham Aerodrome to Marine Park, Hove, Sussex, for Page & Miles Ltd on 4 July 1911 by Horatio Barber. 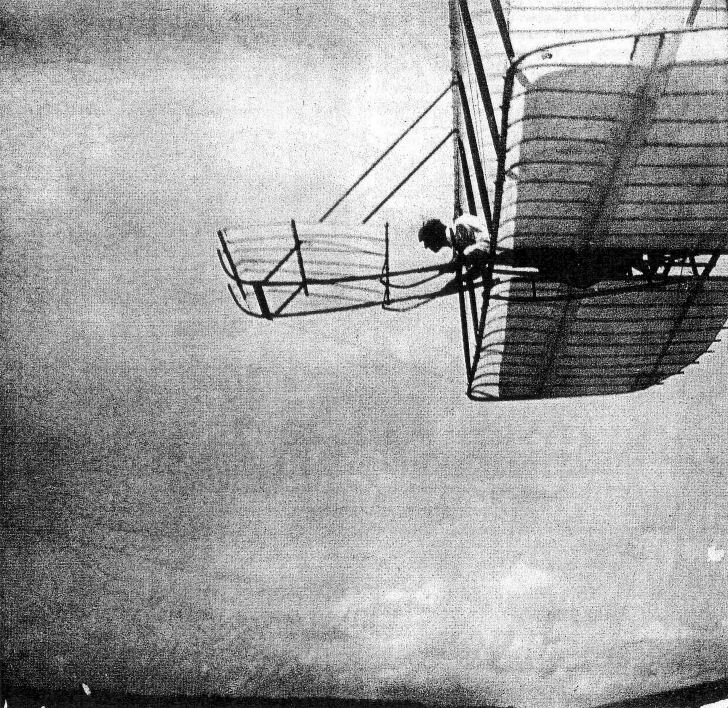 Orville Wright prepares to fly a Model К 'Baby Wright' at Dayton in 1911. Designed for speed and altitude competitions, this short-span aircraft could attain 70-80mph on an eight-cylinder 60hp engine. 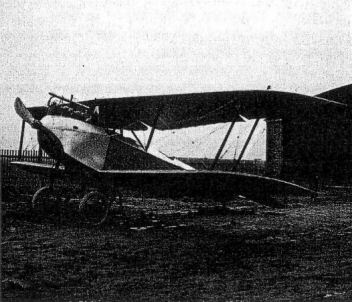 The Royal Aircraft Factory's unconventional experimental S.E.1 canard biplane was destroyed when the Factory's Assistant Superintendent, Lieutenant Ridge, insisted that he fly it, even though he had his pilot's licence only the previous evening. 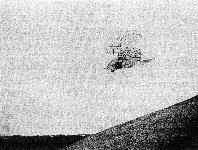 Ridge was thrown out and killed when the S.E.1 sideslipped into the ground. Seen here in his 1911 Circuit of Britain biplane, S F Cody (Cowdery) is wearing a felt-padded safety helmet sold by Gamages, a London department store, but has no safety belt or protective clothing. 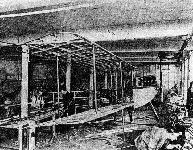 Also visible are some of the bamboo booms carrying the forward elevators, and the long bamboo poles from the base of the control column by which those controls were operated. They have been reinforced with binding between the nodes. A French military aviator prepares to depart on a reconnaissance flight in an REP monoplane in 1914. The breed died out during the First World War. 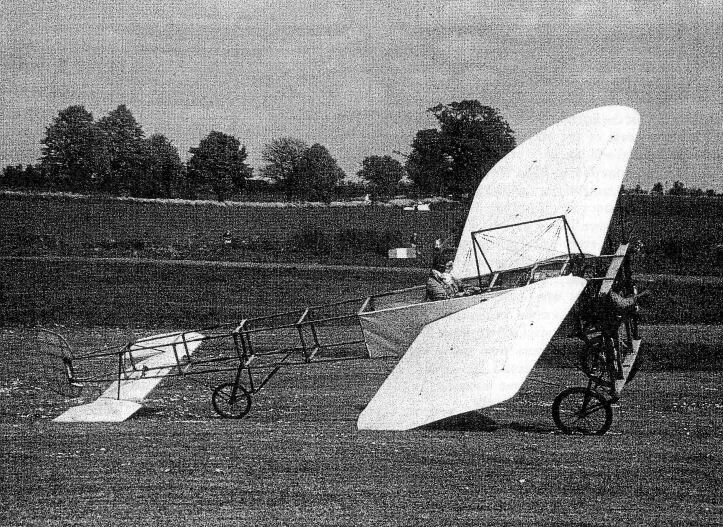 Tom Sopwith runs up the 70hp Gnome rotary engine his new Bleriot XI two-seater on Long Island in the USA on 10 May 1911, the day it was wrecked in a crash without injuring its two occupants. Apart from the risk of damage, the practice of using a gang of men to restrain an aircraft imposed unquantifiable stresses on the structure. 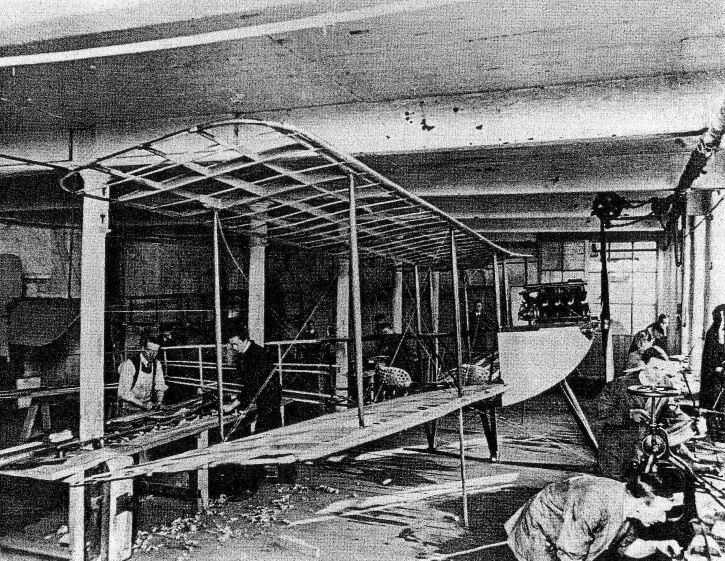 The Avro works at Clifton Street, Manchester in early 1912, with the second Type E biplane under construction. Oscar Gnosspelius's monoplane No 2 was unsuccessful when tested in its original form in November 1911, but flight was achieved on 14 February 1912. This photograph of the machine taxiing out on Lake Windermere was taken shortly after. One of the monoplanes that came under suspicion was the Bristol Coanda. 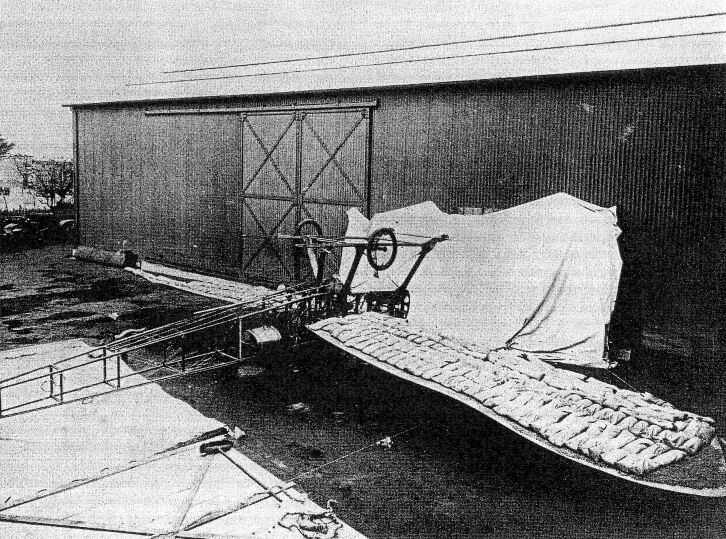 THis one is undergoing a manufacturer's wing-loading test in 1912, inverted with loose sand and sandbags spread over the underside of its wings. A Bristol Coanda monoplane under construction. Designed by Rumanian Henri Coanda, these monoplanes found favour and orders on the European continent. 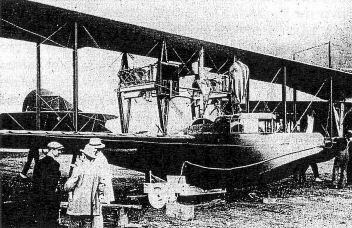 This Salmson-powered Leveque flying boat was photographed at the Deauville meeting in August 1913. The first Schneider-Trophy contest was held during the 1913 Monaco meeting. It was won by Frenchman Maurice Prevost in this Deperdussin seaplane, powered by a fourteen-cylinder Gnome engine. Early aircraft were easily damaged but easily repaired. On 7 April 1913 French pilot Maurice Prevost flattened out 'perhaps a foot too high' as he alighted in his Deperdussin seaplane during the Monaco Hydro-aeroplane Meeting. As the aircraft pancaked, its tail float hit a wave and the rear fuselage failed. Two days later the aircraft was nearly ready to fly again, and on 16 April it became the winner of the first Schneider Trophy Contest. Another variation of the control theme. The 1912 Blackburn monoplane belonging to the Shuttleworth Collection has conventional rudder pedals, but the column is swung up and down to operate the elevators, and the wheel at its top is turned to work the wing warping. Modern-day pilots find this a bit disconcerting at first. A classic German design of 1912 was the Rumpler Taube monoplane, so named because of the dove-like planform of its wings, which had generous external bracing. 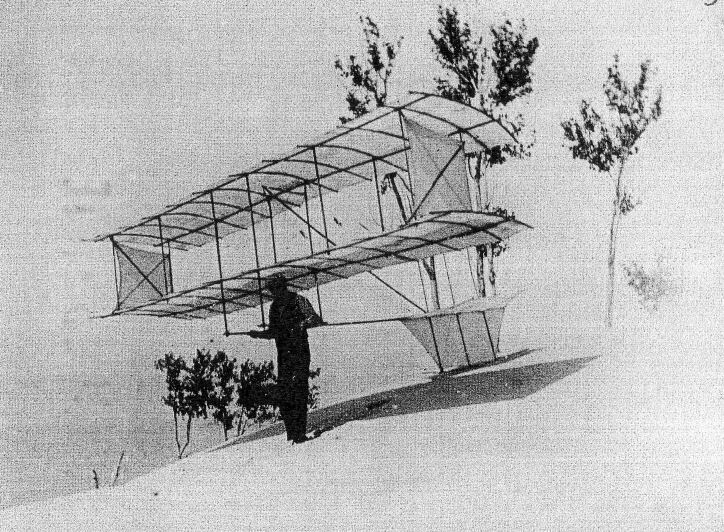 The first powered Flyer outside the camp building on November 1903. 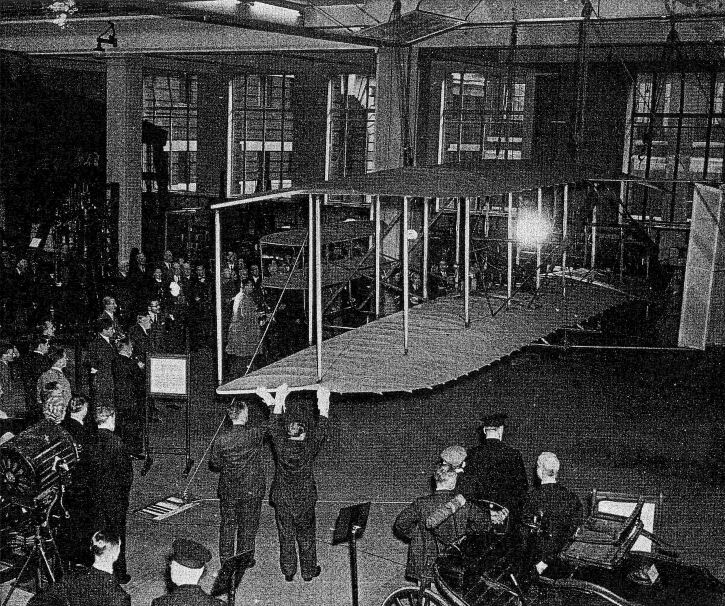 The smaller shed was the one originally erected for the 1901 glider; the larger one was built in 1903 specially for the Flyer. 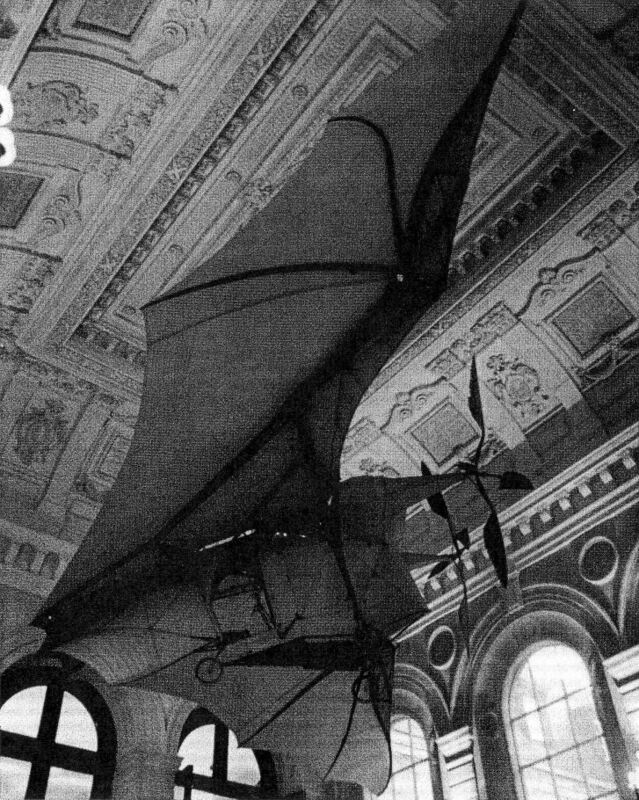 Owing to a disagreement with the Smithsonian Institution, Orwille Wright entrusted the 1903 Flyer to London's Science Museum, where it was displayed from 1928 until 1940, when it was disassembled and stored to keep it safe from bombing. In 1943 Orville decided that the aeroplane should be returned to the USA after the war's end, and after a few years back on show in the Science Museum it duly went to the Smithsonian in 1948. 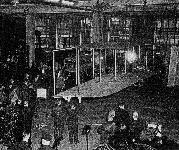 Here it is being lowered from its place in the Science Museum on 18 October 1948 in readiness for its return home. An exact reproduction, made by de Havilland apprentices, replaced it in London. 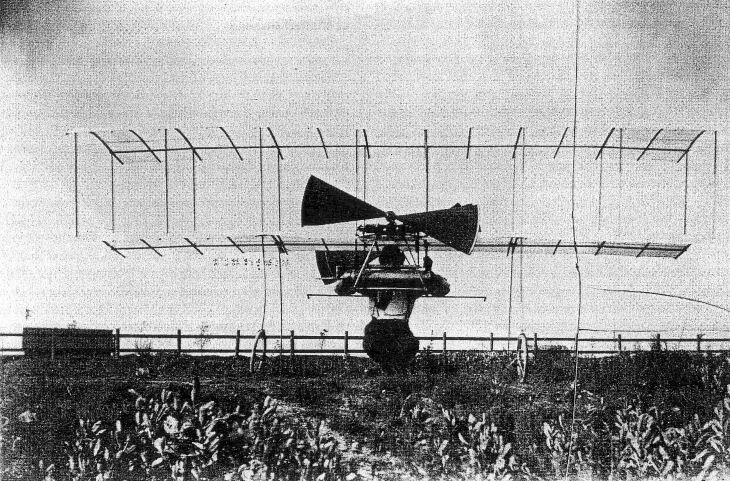 This view of the Wrights' 1904 Flyer and its shed gives a good impression of the rough terrain in the Huffman Prarie, which in part led to the wise decision to adopt a weight-and-derrick launching system. 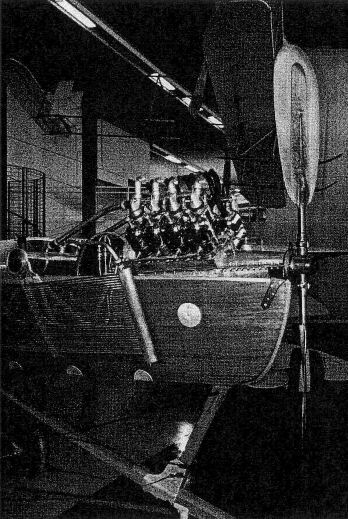 The engine installation on the 1903 Wright Flyer is well depicted in this study of a reproduction in the Experimental Aircraft Association Museum. 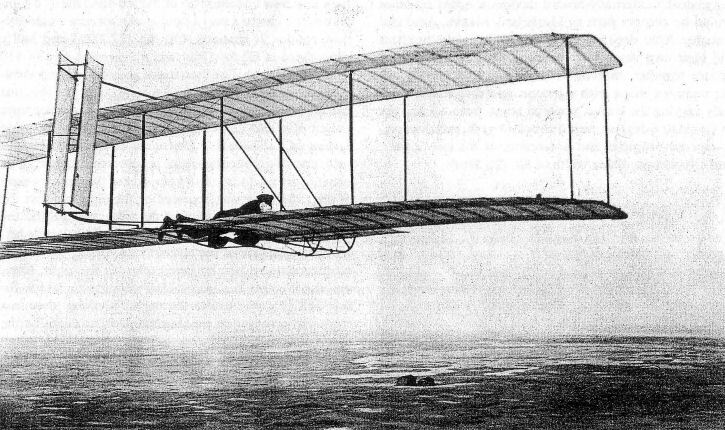 The control system evolved by the Wright brothers. 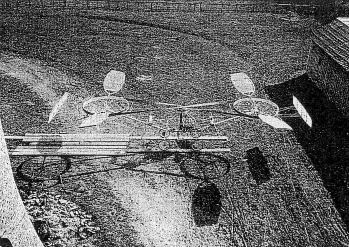 The heavy lines show the run of the cables from the hip cradle, and the cranks linking the warping control with the twin rudders are clearly visible. 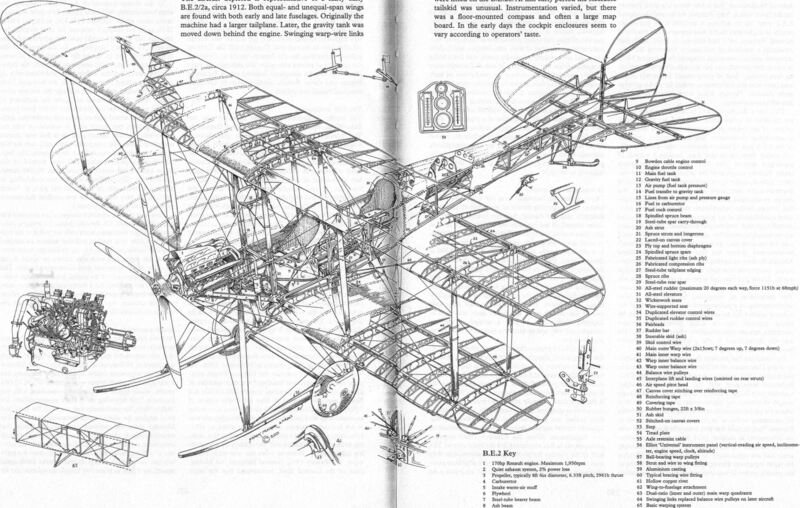 Frank Munger's cutaway of the engine for the 1903 Wright Flyer reveals its essential features and ingenious simplicity. 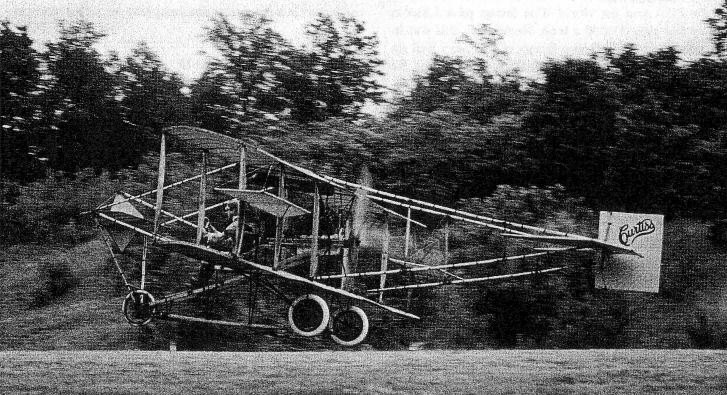 Chanute and Herring achieved their greatest success with this biplane, seen here with 'side curtains' between the upper and lower wings that were soon disposed of. Chanute's most significant contribution was the introduction of wire cross-bracing based on the civil engineer's Pratt truss, used in bridge-building. Hiram Maxim's massive test rig on its track in Baldwyn's Park, Kent, England, in 1894, shortly before its test run on 31 July, when it broke free from its restraining rails and was damaged in the ensuing crash. Maxim. 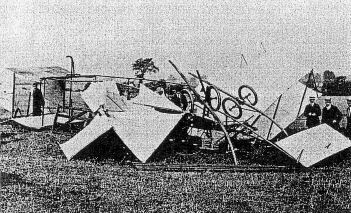 The huge steam-powered biplane of 1894-1895 which lifted off the starting rails but became entangled with the upper restraining rails and was badly damaged at Baldwyn's Park, Kent in July 1895. 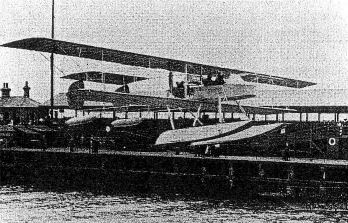 Having made an important contribution with his double-surfaced aerofoils, Horatio Phillips then applied to a series of multiplanes with numerous slat-like high-aspect-ratio wings in a 'Venetian blind' arrangement. This is the unpiloted model he tested with small success on a circular track at Harrow in 1893. 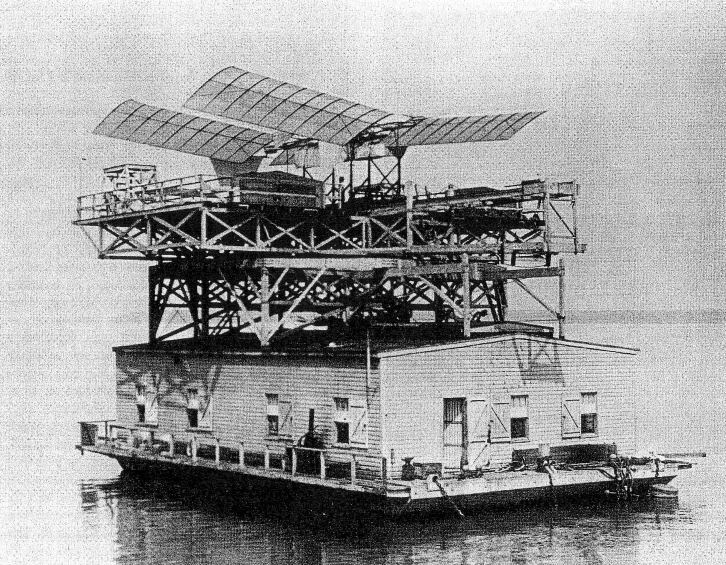 Samuel Langley's full-size Aerodrome atop its houseboat on the Potomac River in October 1903. Structurally weak and underpowered, it failed to fly and plunged into the river on both attempts to fly. 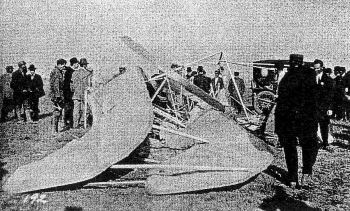 Langley's Aerodrome suffers a structural failure as it is launched from its catapult on 8 December 1903. This dramatic and very public failure marked the end of Langley's experiments. 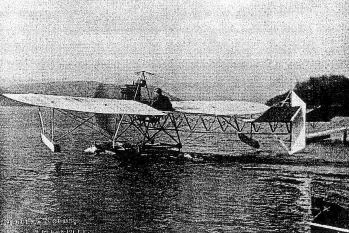 The Breguet central-float seaplane flown by Bregi during the Deauville meeting in August 1913. The inauguration of the world's first scheduled airline service occured on 1 January 1914, when the St Petersburg-Tampa Airboat Line of Florida, USA, began a twice-daily passenger service between the two towns, using a Benoist Type IV flying boat. 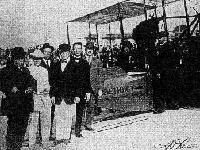 Seen here on that occasion are, left to right: F C Bannister, T W Weston, A G Pheil (the first passenger), Tpny Jannus (pilot), P E Fanstler and L A Whitney (organiser). 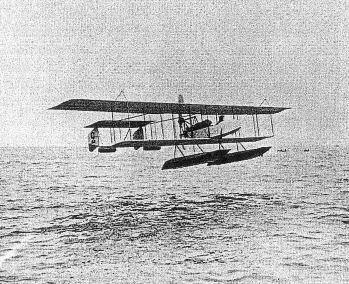 By 1912 most of the leading aircraft manufacturers were offering waterborne versions of their products. 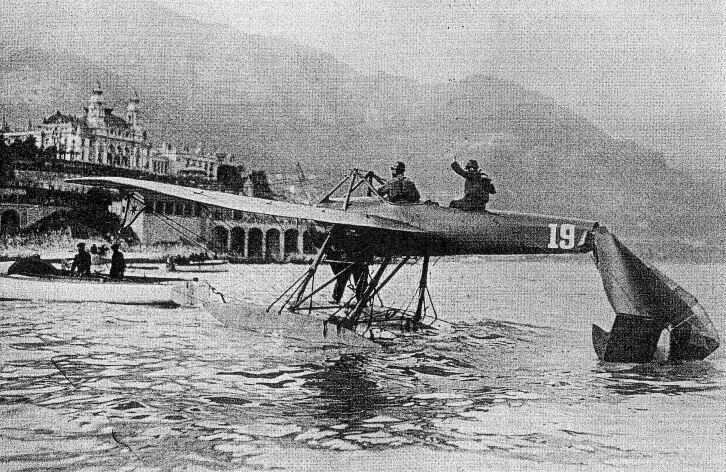 This is pilot Fischer alighting on a Henry Farman seaplane during the Monaco meeting in April 1913. By 1914 the DFW company was producing elegant biplanes like this small two-seater. A production licence was agreed with Beardmore in the UK, but the war brought the scheme to an end. 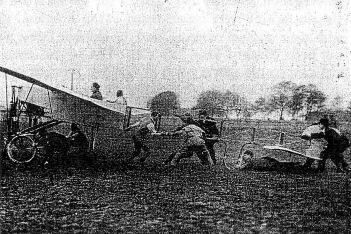 A V Roe in his first aeroplane, powered by a 6hp JAP engine, on the 'pull-up' at Brooklands in 1907. Its close resemblance to the model is evident. 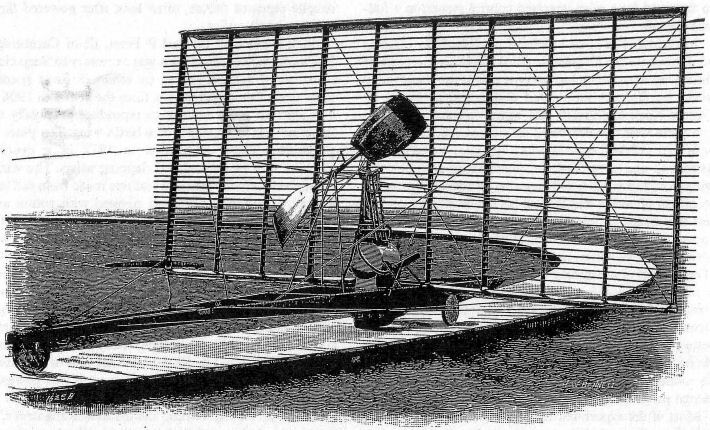 Many pioneers relied upon models rather than windtunnel experiments. 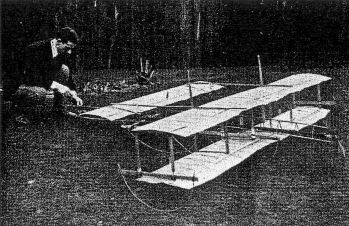 Here, A. V. Roe tends to the large rubber-powered pusher biplane model, one of several he tested, that formed the basis of his first full-size aeroplane. 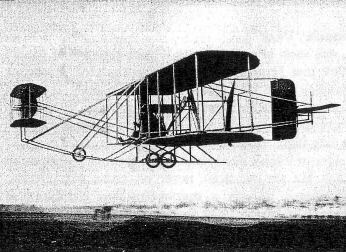 In Denmark, Jacob Ellehammer made a brief tethered hop-flight round a circular track on this semi-biplane in September 1906, but he was a passenger rather than a pilot. 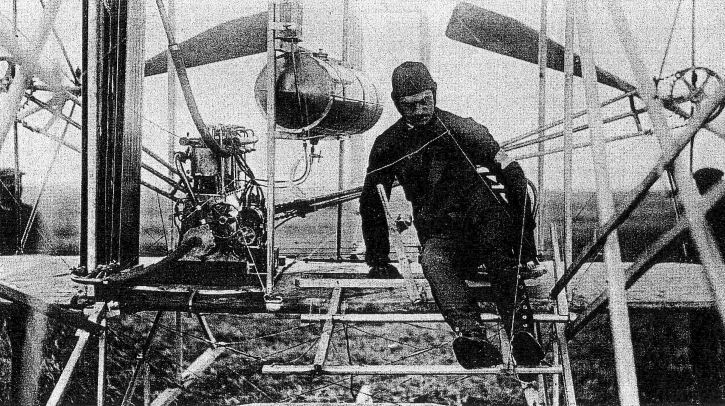 Paul Cornu, a salesman, claimed to have achieved sucessful vertical flight in this tandem-rotor helicopter in November 1907. His assertion has, however, been called into question. 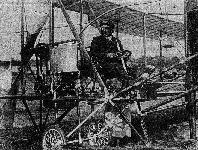 The first full-size conventional tractor monoplane was built by Trajan Vuia, a Paris-domiciled Transylvanian. 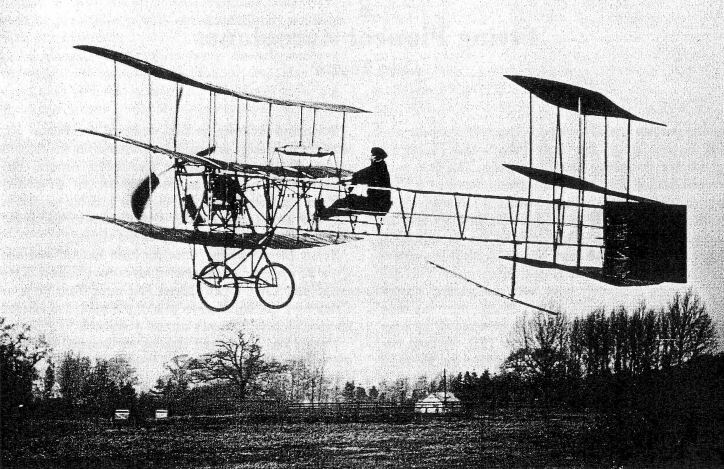 First tested in March, 1906, it was powered by a Serpollet carbonic acid gas motor and managed to achieve a number of hops. 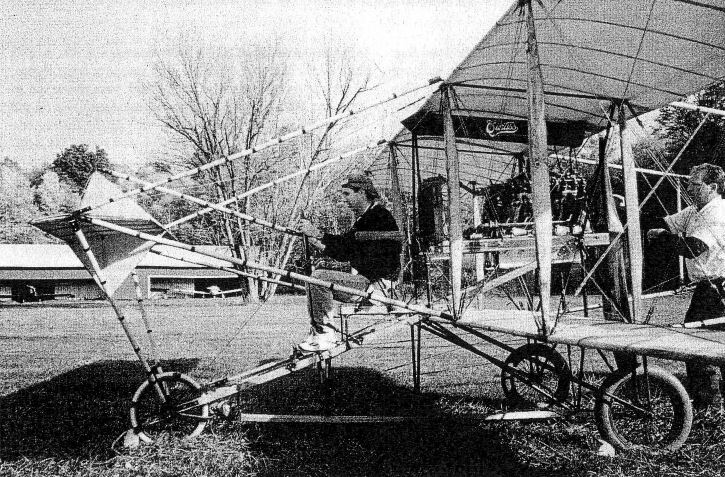 Jacob Degen made insignificant hops in his ornithopter in the early 1800s, but only when a balloon was added. This essential appendage was often omitted from inllustrations of his apparatus. 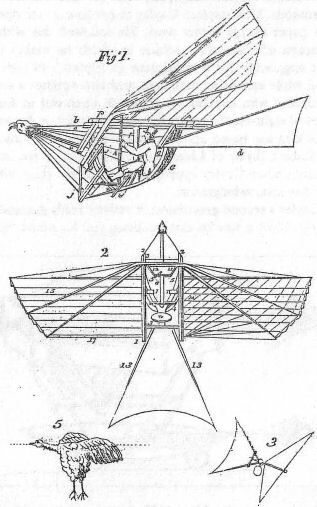 Thomas Walker's first design for a flying machine was this human-powered ornithopter of 1810. Figure 3 at bottom right shows the simple model glider he tested. 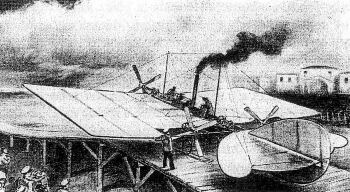 By 1831 Walker had greatly revised his ideas, now proposing a tandem-wing design with pilot-operated flappers. 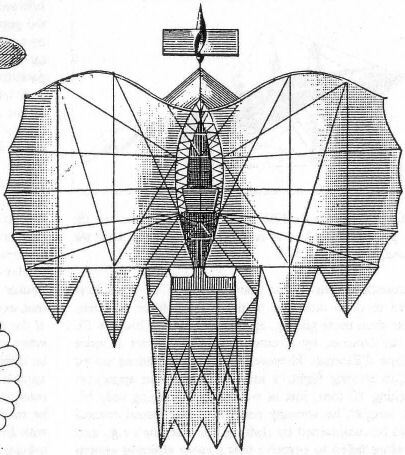 Michel Loup's proposed bird-form design of 1853. 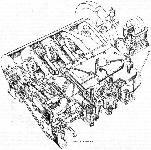 A plan view of Viscount Carlingford's "aerial chariot", which had a propeller operated by the pilot. 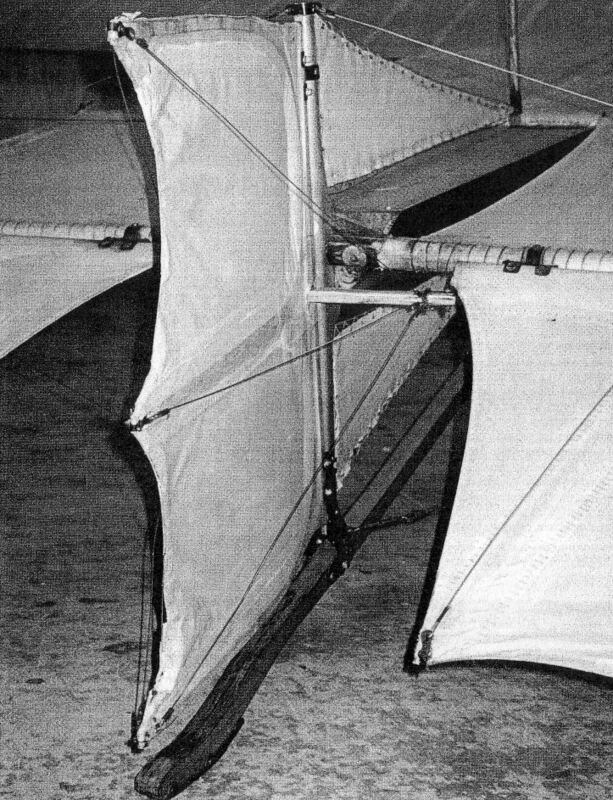 The albatross-inspired glider tested by Jean-Marie Le Bris with minor success. The collapsible multicellular machine built and briefly tested by F.H.Wenham in 1866 anticipated the boxkite by nearly 30 years. Its creator hoped to propel it using pilot-operated flappers at the tips of long arms extending beyond the machine's lifting surfaces. 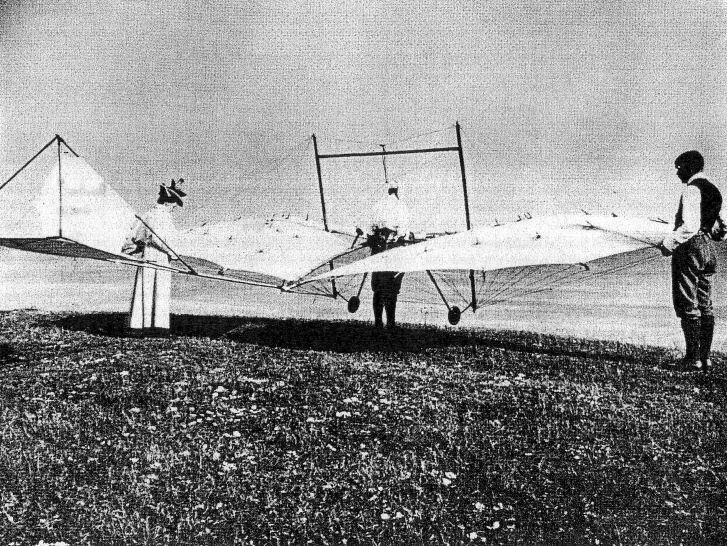 The elegant prone-pilot monoplane glider proposed by Gustav Koch in 1889 has been overlooked by recent historians, though it was quite well publicised at the time. 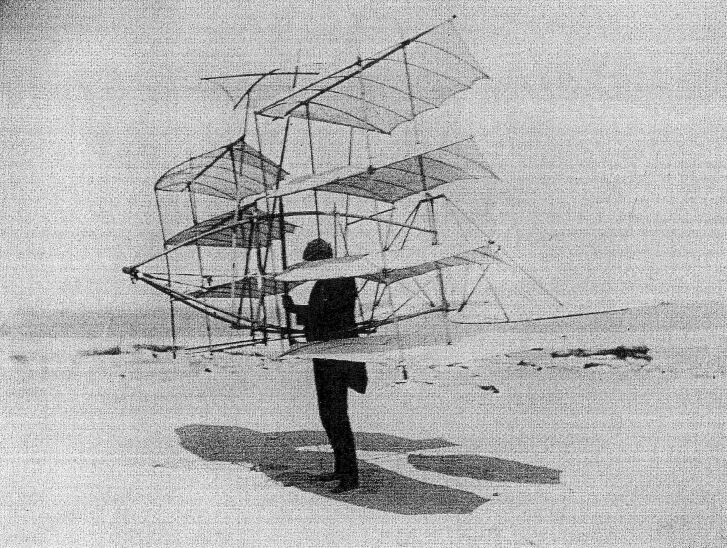 E. P. Frost built this massive ornithopter in 1877 and, despite its failure, persisted in following this futile line of experiment into the 1900s. 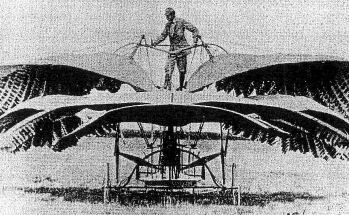 Percy Pilcher made no aerodynamic experiments, but he quickly found that the acute dihedral he had given the wings of his 1895 Bat glider, as seen here, greatly inhibited his weight-shift control and made the machine very vulnerable to side gusts, especially on the ground. After reducing the angle until it was 'almost neutral' he was able to make successful flight. 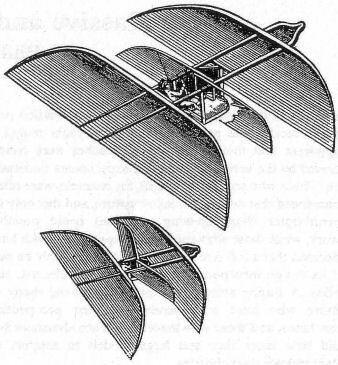 Clement Ader's own sketch of his Eole of 1890 shows its bat-like wings, feather-bladed single propeller and the caterpillar-track undercarriage that the inventor considered fitting instead of wheels. 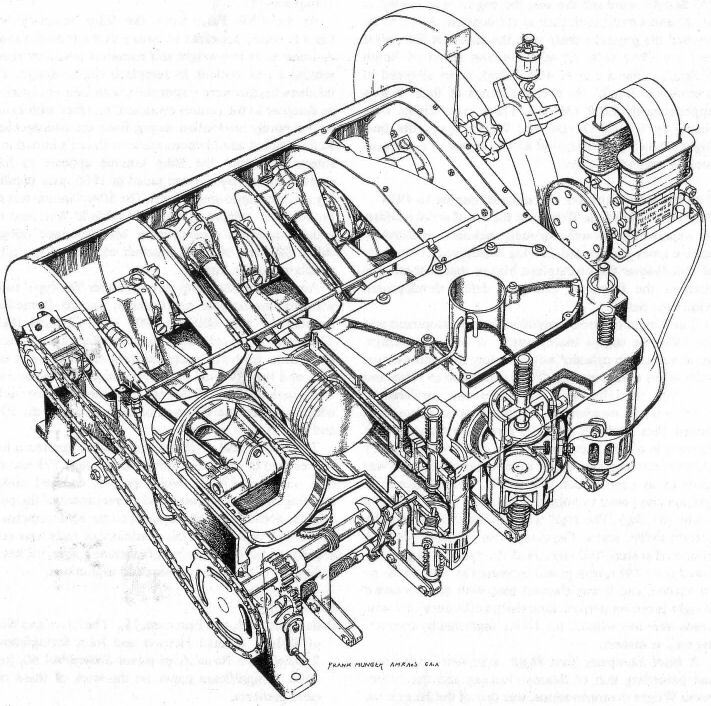 The fan-like protrusion on top of the fuselage is the radiator for its 20hp steam engine. 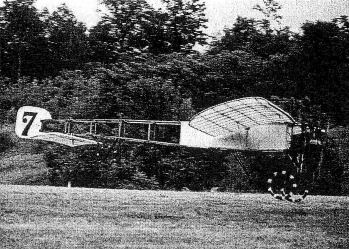 Lawrence Hargrave's tandem-wing hang glider, tested in June 1894, proved completely unmanageable, and probably served to turn him totally against monoplanes. Failing to appreciate the need for control, he sought refuge in the total stability of his boxkite format. 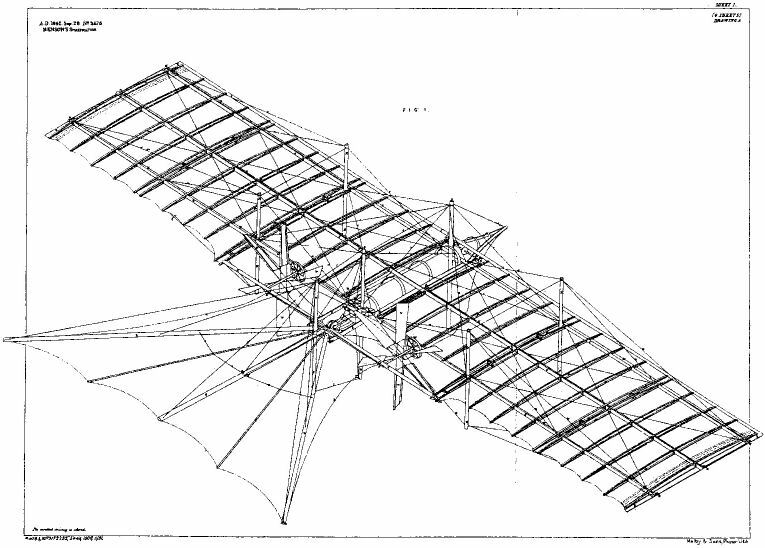 Octave Chanute's multiplane hang glider, tested in the Indiana sand dunes in 1896, was tested in an assortment of configurations before it ended up in this form, as a quadriplane with a small central upper surface and a monoplane tailplane. 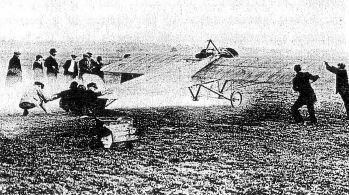 Impatiently applying power before the basic problems of controlled flight had been tackled, Herring built this diminutive and marginally powered biplane with a 3-5hp engine driving tandem pusher and tractor propellers. 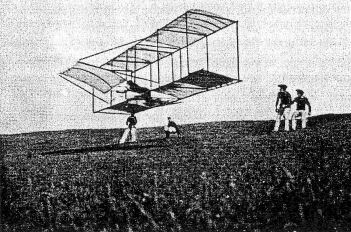 Tested in October 1897, it was barely able to fly, but its creator was satisfied and planned a more powerful successor. 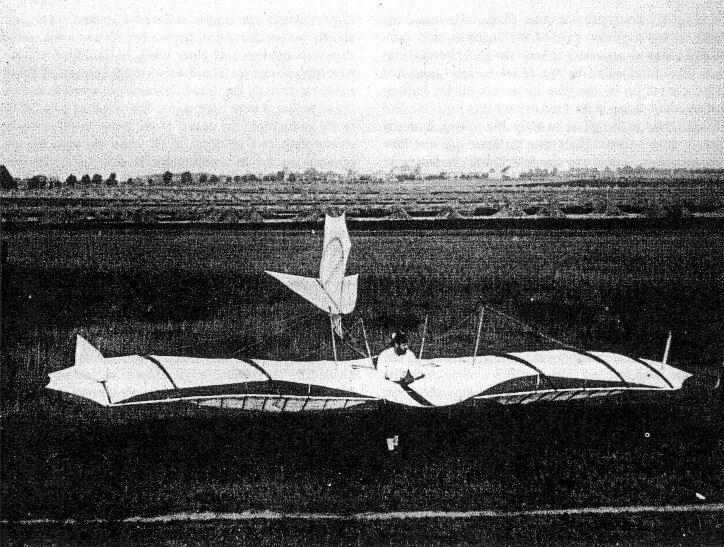 The first Wright-type glider tested by Ferdinand Ferber in 1902. Its crude construction is evident. 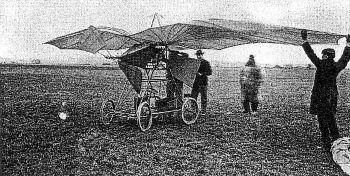 The Ferber VII-B of 1905 had a 12hp Peugeot engine and was launched from an overhead cable to make shallow powered glides. 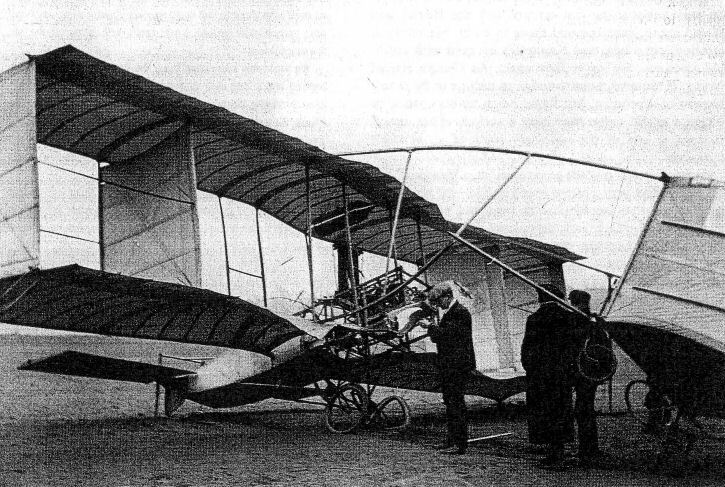 The Bleriot VII, which underwent major modifications during its life, began as a low-wing monoplane, as seen here, but ended up as a shoulder-wing monoplane before it was wrecked in mid-December 1907. An overhead view of the Antoinette monoplane in the Musee de l'Air. The control wheels on each side of the pilot's seat are just discernible; that on the pilot's left controlled roll, and that on his right worked the elevator. 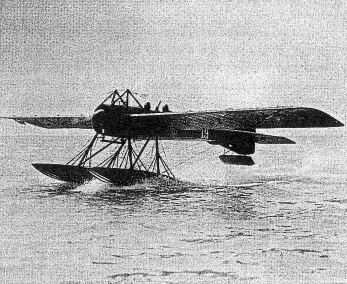 There was a conventional rudder bar. 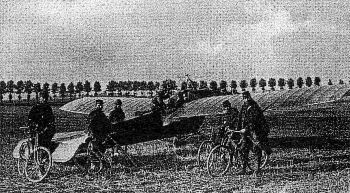 One of the mainstay engines of the pioneers was the Antoinette, seen here in its 50hp eight-cylinder version in an Antoinette monoplane. The inefficient Paddel-blade propellers, which were not geared down but were attached directly to the engine driveshaft, wasted a lot of the power. 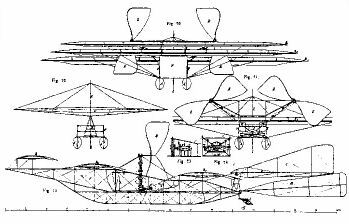 Drawings of the large tandem-wing triplane floatplane built by Wilhelm Kress of Austria in 1901. It was damaged and sank before flight was attempted. 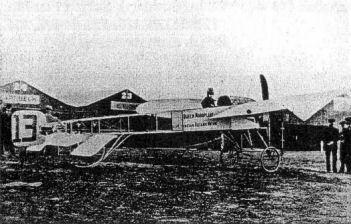 A US-built Queen monoplane, one of many copies of the ubiquitous Bleriot XI, of the type used for the first airmail flights in the USA, at the Nassau Boulevard Meet in September 1911.